Masterclass: a session of tuition by an expert, esp a musician, for exceptional students, usually given in public or on television. This year’s distinguished Menuhin Competition, (12 – 22 April) now in its 35th year (but held every two years), was founded by its iconic, eponymous violin virtuoso, Yehudi Menuhin, with the goal of nurturing promising young violinists. Violinist Maxim Vengerov has certainly continued that tradition over three inspiring master classes in Geneva, the host venue for the 2018 competition. Diana Adamyan from Armenia was the overall winner of the senior category. The 2018 prize winners. Her performance of the Bruch violin concerto was so nuanced, sublime and effused with emotion that it’s hard to get your head round the fact that she is only eighteen years old! A star in the making. Anyhow, back to the tuition. A Menuhin Competition masterclass is a valuable opportunity for a young musician to learn from one of the most revered living violinists in the world. And if you want to do something you’ve never done before, it makes sense to be guided by someone who has already done it, and even better if they’ve excelled at it. Maxim Vengerov duly stepped up to the teacher’s plate and knocked it out of the park. I attended a masterclass he gave in the Sheldonian Theatre in Oxford a few years ago, recorded for posterity in my first blog! These 2018 recorded masterclass sessions are manna from heaven for music students and violin lovers. Maestro Vengerov gives priceless advice to participants to help them develop their technical, artistic and performance skills. As well as being a world renowned violin virtuoso and conductor, Maxim Vengerov is currently the Ambassador and visiting Professor of the Menuhin Music Academy in Switzerland (IMMA) and as of September 2016, the Polonsky Visiting Professor of Violin at the Royal College of Music in London. Maxim Vengerov is not only an outstanding performer, but also a natural and gifted teacher. His love of the instrument, the music and his students is like a rich, warm sonata that envelops you in a hermetic bubble of energetic nurturing, lighthearted humour and scholarly encouragement. Is it obvious I worship him?! These recent masterclass videos are entertaining and inspiring for music lovers and non musicians alike, because they instill an appreciation of the talent, work and dedication that goes into perfecting just one piece; highlighting the depth of knowledge and mastery required to truly convey a composer’s mind through the sound of his notes, to draw the listener in. It takes a virtuoso to express advanced technique infused with emotion and not get lost in either. It’s called interpretation and it’s a fine line to walk. What I love is that Maxim immediately knows where the improvement points are, and uses a range of methods to help the students expand their abilities. He is assertive and appreciative in equal measure, a winning combination. I love how he invigorates and encourages them without being overpowering or striking fear into their hearts, and motivates without crushing their confidence. Not everyone it seems, can give an accomplished masterclass. A Masterclass in how not to give a masterclass. Vengerov shows the pupils where they can improve, be it in phrasing, the intricacies of bowing, depending on the type of colour and sound required, their technique, voice and musicality, all demonstrated with such wisdom and wit. He humbly shares his own experience of learning with the legendary cellist Mstislav Rostropovich and jokes about how hard it is to just play two notes evenly! You can really hear what a difference his 1747 ‘Kreutzer’ Stradivarius violin paired with Jascha Heifetz’s bow makes. I have included these wonderful masterclasses as a tribute to musical artistic endeavour! It’s also worth seeing the excellent masterclass observations and teachings from some of the other 2018 Menuhin Competition jury members. I think the students themselves deserve a round of applause, it must be nerve-racking enough to be taught by a legend, let alone in front of an audience, and I applaud them for their dedication and ambition. 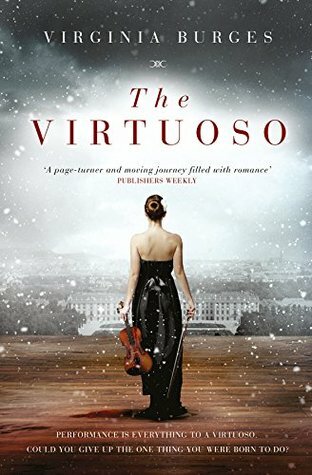 A violin masterclass happens to be the setting of the opening chapter of my fiction novel, The Virtuoso. I am in the process of creating a new book cover with a new strapline. 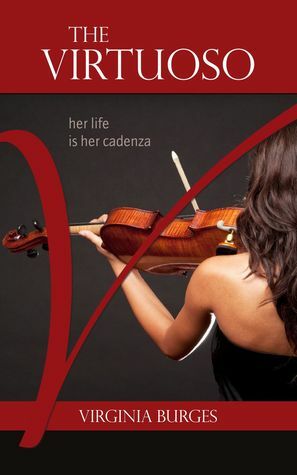 I think the current strapline: her life is her cadenza, (although it embodies the story) may be too narrow for non musical readers. Performance is everything to a virtuoso. Could you give up the one thing you felt you were born to do? Performance is everything to a virtuoso. Is redemption possible without the music? Let me know what you think if you have read it, or have a constructive opinion. Feedback is always helpful when implementing changes. Thanks! The Russian’s are in the house! Thankfully not malicious, vengeful spies, instead respected individuals of the intelligent, cultural and artistic kind – and they are playing heart-felt music. Classical music is an auditory nerve agent of a spiritual nature; it seeps into your cells and elicits various emotional reactions, ideas, memories, feelings and visual imagery. Tchaikovksy’s Violin Concerto in D Major, Opus 35 is one of the great romantic violin concertos ever written, and a staple of the concert violinist’s repertoire. It was the only violin concerto the Romantic era composer wrote, and I don’t think he could have followed it up with a better one somehow. It has many wonderful, subjective attributes which weren’t fully appreciated after it was first published and performed. 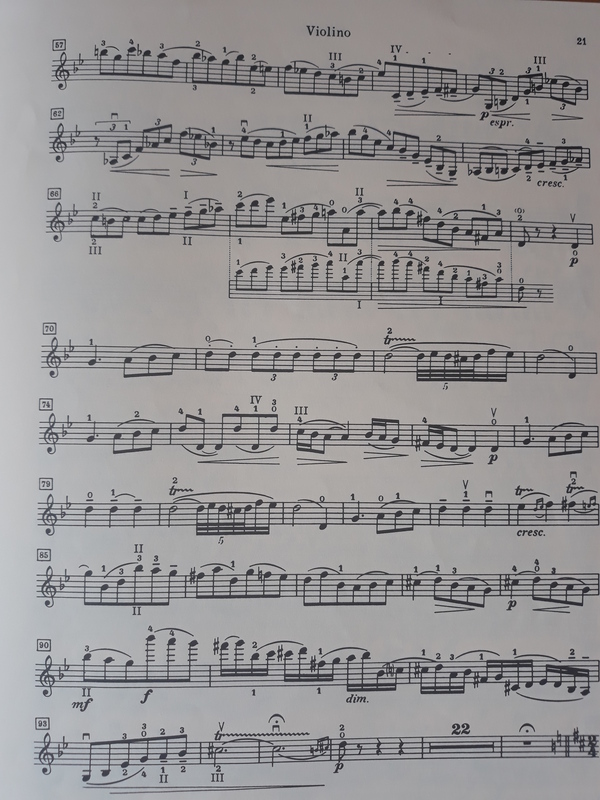 It is, in my humble opinion, melodic, lyrical, soulful, virtuosic and so very Russian in its expressive depths… Did I mention it’s also fiendishly difficult to play? There are many tricky trills, finger-bending and eye-watering double-stopping, glissandi, frequent leaps and thrilling passages to for a soloist to negotiate. The opening movement is lengthy and physically demanding, with many notes in the stratosphere of what is possible for the violin. 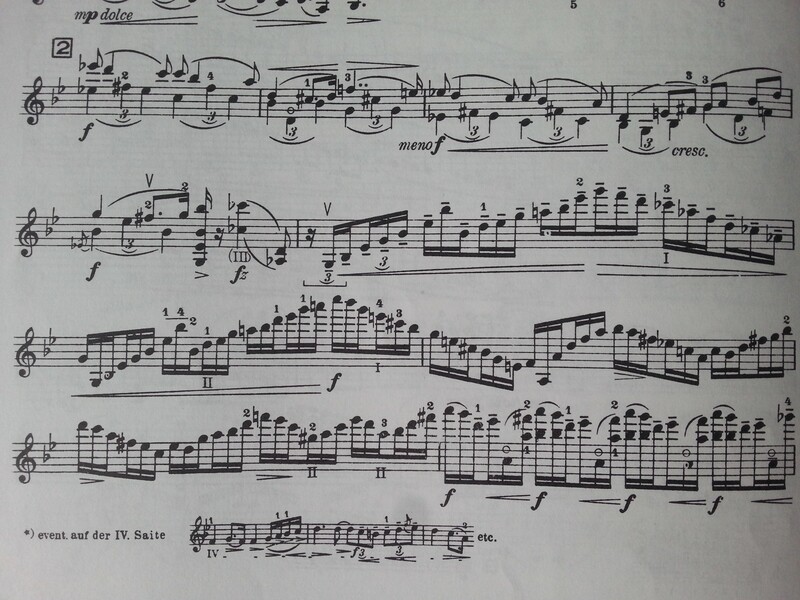 It’s hard to maintain intonation and energy throughout these gruelling sections. A full body/brain workout for sure. It’s way over my playing ability for the most part, and even causes consternation for the professionals. 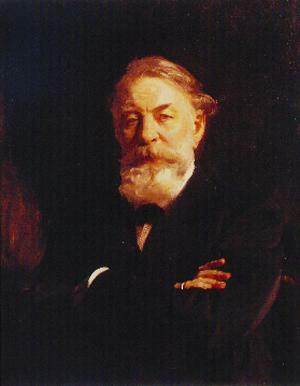 Tachikovsky originally dedicated the concerto to revered Russian virtuoso and teacher Leopold Auer, who rather embarrassingly declined to play its debut performance. Relations between composer and artist cooled, and Tchaikovsky ruefully wrote in one of his letters that the episode ‘had the effect of casting this unfortunate child of my imagination into the limbo of the hopelessly forgotten’. “I had championed the symphonic works of the young composer (who was at that time not universally recognized), I could not feel the same enthusiasm for the Violin Concerto, with the exception of the first movement; still less could I place it on the same level as his purely orchestral compositions. I am still of the same opinion. My delay in bringing the concerto before the public was partly due to this doubt in my mind as to its intrinsic worth, and partly that I would have found it necessary, for purely technical reasons, to make some slight alterations in the passages of the solo part. 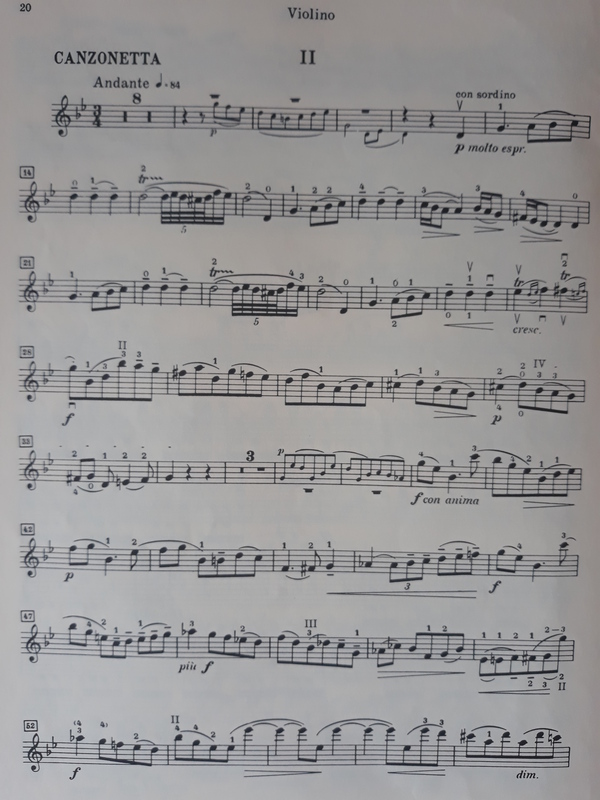 This delicate and difficult task I subsequently undertook, and re-edited the violin solo part, and it is this edition which has been played by me, and also by my pupils, up to the present day. It seems to me that Oistrakh connected with the music on a soul level. In this sublime recording of his own version he conveys its musical essence through a beautiful and plaintive purity of tone, a restrained yet intense vibrato, and mind-blowing virtuosity without sacrificing accuracy. It is astounding! He gives a performance full of pathos, passion and precision but does not slide into schmaltzy self-indulgence, or become sentimental to the point of being sickly. Oistrakh takes us to dizzying heights in the first movement (Allegro Moderato) with stunning syncopated semi-quavers interspersed with soft, pianissimo passages of eloquent singing on his Stradivarius, only to forcefully proclaim his intermittent chords in conversation with the orchestra before the final ascending, chord-laden runs that build in volume and speed until they climax with the entry of the lush main theme from the orchestra. The violin’s soaring passages of rhythmic complexity and melody in increasingly higher realms make my heart dance. This movement seems entirely evocative of Spring: there is some leftover wintry grit and determination giving way to vivid, vibrant and powerful new shoots of life and energy. It is like an epic ballet score (of which Tchaikovsky was a master), without any dancing. Come to think of it, maybe someone should choreograph a dance routine to the first movement? I love to play the second movement (Andante), titled Canzonetta in the key of G minor, which expresses a mournful, song like interlude, a kind of reflective musing on suffering; perhaps a lamentation of Tchaikovsky’s soul. Oistrakh’s dynamics are exquisitely soft and gentle, and the music is marked con sordino (use of a mute), to subdue the effect further. The third movement (Allegro vivacissimo), back to the D Major key, is a vivid tapestry of Slavic and Russian folk tunes woven together in a very bold, brisk and dynamic finale. Despite being written in the key of D Major, the concerto has an unmistakable melancholy feel. Tchaikovsky composed the work in spring 1878, after a period of personal strife and unhappiness. His disastrous six week marriage to Antonina Miliukova had failed and he was seeking solace from his misery with a tour of Switzerland, France and Italy. It is widely thought that the inspiration for the work sprang from his infatuation for a violinist he had tutored in composition and music theory at the Moscow Conservatory, Josef Kotek. It was Kotek who came to his rescue in Clarens, Switzerland, carrying many scores in his suitcase. Among them was Lalo’s Symphonie Espagnole, a concertante work for violin and orchestra which influenced Tchaikovsky greatly on his concerto. I can ‘hear’ similarities between Lalo’s finale and Tchaikovsky’s opening movement. On the banks of lake Geneva they worked together on the solo sections and the sketching was completed in just eleven days, with the complete scoring finished in two weeks. He must have written it in some kind of creative frenzy. Somewhat surprisingly, given his close collaboration with the composer, Kotek also refused to perform the premiere of Tchaikovsky’s violin concerto. Another early setback for the work. However, Josef Kotek redeemed himself by instigating a life changing friendship for Tchaikovsky, as he enthusiastically edified his former tutor to his employer, Nadheza von Meck, a wealthy arts patron. Tchaikovsky began composing for her ‘in house’ string ensemble, (which Josef Kotek played in), resulting in a rewarding, if bizarre, fourteen year working relationship vital to Tchaikovsky’s composing career. 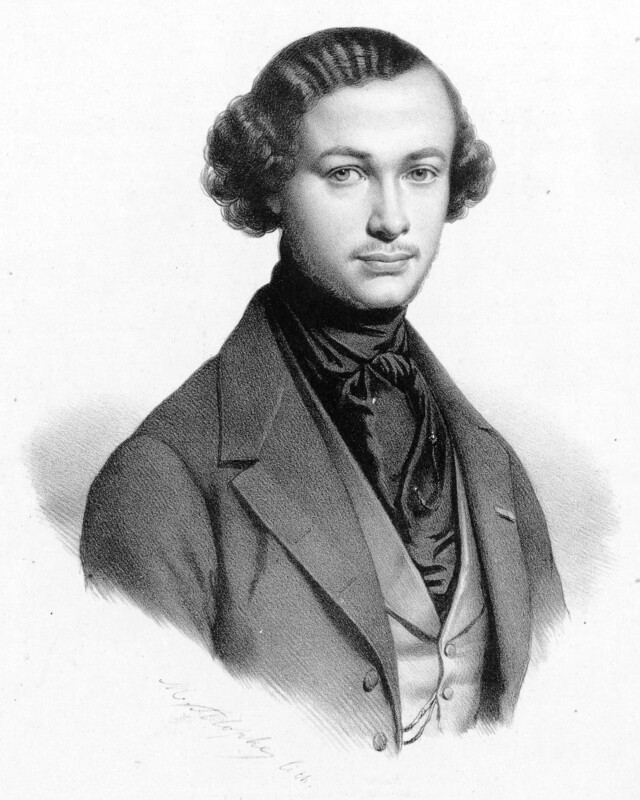 A later work by Tchaikovsky, the Valse-Scherzo for Violin and Orchestra was dedicated to Kotek. Tchaikovsky rededicated his violin concerto to Adolph Brodsky, who premiered it in Vienna on 4th December 1881. The music critic Eduard Hanslick notoriously described it as “stinking music” — an insult which cut Tchaikovsky to the core. “In referring to this outstanding artist, I cannot help availing myself of this opportunity to express publicly the fervent gratitude which to my dying day I shall always feel for him because of the following incident. In 1877 I wrote a Violin Concerto and dedicated it to Mr L. Auer. I do not know whether Mr Auer felt himself flattered by my dedication, but the point is that, in spite of his genuine friendliness towards me, he never wanted to surmount the difficulties of this concerto and in fact pronounced it to be impossible to play—a verdict which, coming from such an authority as this Saint Petersburg-based virtuoso, plunged this unhappy child of my imagination into an abyss of what seemed to be irrevocable oblivion. One day, some five years after my concerto had been written and published, when I was living in Rome, I went into a café and happened to pick up an issue of the Neue Freie Presse in whose feuilleton section there was an article by the famous critic Hanslick about a recent concert by the Vienna Philharmonic Society which, amongst other things, had also featured that hapless violin creation of mine which L. S. Auer had condemned to non-existence a few years earlier. Herr Hanslick reproached the soloist (who was none other than A. D. Brodsky) for having made such a bad choice and lambasted my poor concerto, liberally strewing the pearls of his caustic humour and firing the most poisoned arrows of his irony. Having read the above comment by this famous and highly influential critic, I could vividly picture to myself how much energy and effort it must have cost Mr Brodsky to get my “stinking concerto” performed by the Vienna Philharmonic, and how aggrieved and unpleasantly struck he must have been by this attitude of a critic towards a work by a fellow-countryman and friend. I of course hastened to convey my most heartfelt gratitude to Mr Brodsky, and from his reply I found out how many trials and tribulations he had had to get through in order to achieve his goal—and his goal was precisely to rescue my concerto from the abyss of oblivion. Mr Brodsky subsequently played the “stinking” concerto everywhere, and was everywhere attacked by critics similar to Hanslick in their approach and their exclusivity of tone, but still the deed was done—my concerto had been saved, and now it is quite frequently played in Western Europe, especially since another excellent violinist, the young Haliř, has come to the aid of Mr Brodsky (further down I shall have a lot to say about this young violinist). This declaration suggests that it was Beethoven’s symphonies in fact which kindled in the young Tchaikovsky the zeal to write music himself, rather than just escaping from everyday reality into the magical realm of Mozart’s opera. Moreover, the feeling of “sadness” which overcame him whenever he heard Beethoven’s music is one that would remain with him all his life, and, if around 1860 it was perhaps mainly due to his despair at the thought that he would never be able to write anything similar since he knew nothing of compositional technique, in later years it was certainly the “tragic struggle with Fate and striving after unattainable ideals” expressed in many of Beethoven’s works that struck a chord with Tchaikovsky. This affinity he felt with Beethoven and the element of ‘struggle’ in the latter’s life and music is perhaps most interestingly revealed in the additions he made to a compilation of biographical material on Beethoven which he started writing in 1873 but did not complete — ‘Beethoven and His Time’. These extra observations of his own suggest that Tchaikovsky clearly empathized with some important moments in Beethoven’s life: the early loss of his mother, the German composer’s struggle against adverse circumstances and against the failings of his own character. Thus, far from being merely a remote, awe-inspiring Old Testament God to him, Tchaikovsky recognized in Beethoven a kindred spirit, namely an artist who was deeply aware of the tragedy of human existence, and who sensed that the only true happiness he could find in life was in music. The comparison in his diary between Mozart and Beethoven, at first sight so ‘unfavourable’ for the latter, might therefore be interpreted, firstly, as a way of expressing how Mozart’s music acted like a balsam on his troubled soul as opposed to Beethoven’s, which reflected back his own suffering, and, secondly, as an implicit confession of how daunting it was to have to write music in the wake of Beethoven — a feeling that was shared by almost all the other great composers of the nineteenth century! After an emotionally fraught birth and challenging early years, this musical ‘enfant terrible’ evolved through much struggle, and grew to walk and talk and eventually sing on the world stage, thanks to the magnificent potential Tchaikovsky suffused within its poignant notes, as well as the dedicated soloists throughout the decades who underwent countless hours of bruised fingers, chafed necks, aching arms and mind-altering concentration, pouring out their heart and soul in bringing it to life. In a comment about Beethoven’s masses Tchaikovsky observed that they were not strictly religious works but, similar to his symphonies, as ‘poetically intensive effusions of sentiment’, permeated by the same ‘spirit of despair and struggle’. I definitely get the feeling that Tchaikovsky’s Violin Concerto in D Major could be described thus, originating from the ‘ideal realm’ that Beethoven inspired in him, both from the perspective of performing and listening. Any creative individual whose work may not have received glowing reviews or achieved early success can take heart from this story – all it takes is a determined and influential champion to make history. Daemon: An attendant or indwelling spirit or one’s genius. An action exhibiting superhuman or diabolical energy or skill. 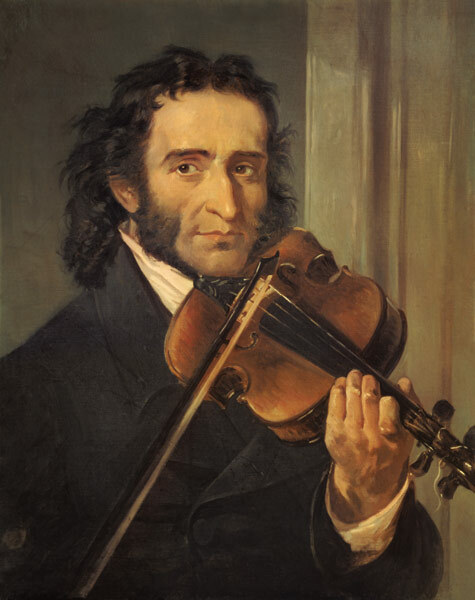 It was Paganini’s 235th birthday on 27th October, and I thought it was high time I revisited some aspects of the maestro’s life and share the incredible performances of his six violin concertos by Massimo Quarta on Paganini’s beloved violin, ‘Il Cannone’. For me these concerto recordings are special, not only because are they performed on ‘Il Cannone’, or because of the virtuosity, sensitivity and artistic fervour they are played with, but also for the fact that they are performed and recorded using Paganini’s original autograph score, which differs in quite a few aspects from the printed 19th century versions. Truly authentic! This was the first time the Violin Concerto No. 1 has been recorded in the original key of E Flat-Major, with the violin tuned up a semitone as Paganini directed on his autograph score. It’s hard to imagine the pressure that Massimo Quarta and his orchestral colleagues must have felt in performing such historic and culturally important recordings. Massimo Quarta was a pupil of Salvatore Accardo and winner of the 1991 International Paganini Violin Competition. His performances with the Orchestra of Genoa’s Teatro Carlo Felice strike a passionate chord and somehow convey a spiritual affinity with Paganini. We can listen to these romantic works exactly as Paganini conceived, composed and most likely played them! When Niccolo Paganini was five years old and began learning to play the mandolin and guitar under his father’s tutelage; his mother, Theresa had a vivid dream. Possibly it was spurred on by knowledge of Giuseppe Tartini’s infamous dream and ensuing composition: the Devil’s Trill Violin Sonata, and it was to have a powerful effect on Paganini’s future as a violin virtuoso of the likes the world had never seen. Theresa’s dream could well be said to have proved a self-fulfilling prophecy for Niccolo. She saw a theatre in flames, and her son, playing triumphant music and standing tall over the flames, with Tartini conducting next to a red devil with a guitar, competing for Paganini’s soul. An angel then appeared and she asked that her boy become a great violinist, whose name would be immortal in the pantheon of musicians. It was his mother’s bizarre dream that likely inspired Paganini in his relentless pursuit of glory and gold. 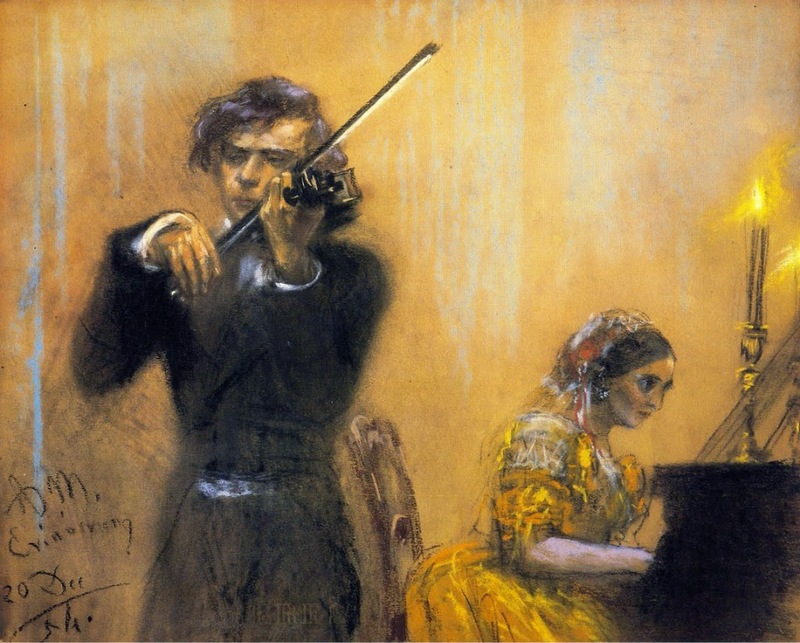 Paganini believed his mother’s dream and carried her vision throughout his astonishing life. This vivid, early association with the devil no doubt contributed greatly to his supreme confidence and later his professional reputation and personal notoriety. Being the devil’s violinist made an interesting narrative, with drama and furore following him almost everywhere he went. It is incomprehensible how he was able to play beyond the limits of his endurance as a man who constantly struggled with his health, and his energies weren’t just reserved for his music! My first blog about the maestro goes into more detail about his life. 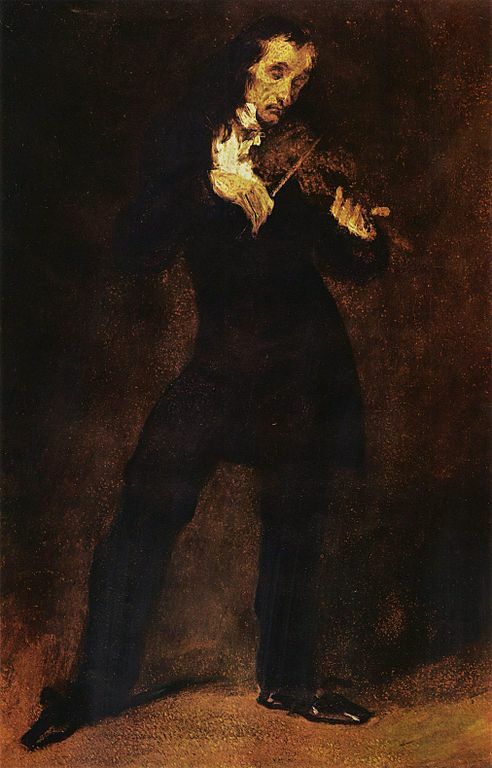 His personality was full of contradictions, many of which Paganini was happy to portray when it suited him. His fame and wealth far exceeded that of any previous violinists. With an inner strength he battled his physical ailments and tilled his creative, commercial and musical soil with an alacrity possibly still unmatched by modern day soloists. He certainly had a significant impact on the young Franz Liszt, a musician who also broke the mould of Romantic era composers and virtuosi, leaving his particular legacy on the piano. Niccolo had composed his first violin sonata (now lost), at the age of 8, only too aware of Mozart’s achievement in writing his first piano concerto at the age of 6!! In addition to his rigorous practice schedule the Paganini’s first showcased their son’s talents in a public concert when he was 11 years old. His parents’ high expectations for their son must also have had a bearing on his beliefs that his destiny was to become the greatest violinist that ever lived; thereby steering him on a path that wasn’t always to make him happy and certainly seemed to possess him. At the age of 19, he had come to the attention of a government minister and was asked to play a short piece during an Easter mass in Santa Croce, Lucca. Paganini brazenly performed a 28 minute concerto! As a young man approaching the apex of his near miraculous abilities, Paganini began composing his stunning 24 Caprices for Solo Violin. His immense talent, (possibly overlooked as the result of blossoming skill attained throughout the many years of hard graft as a sickly youth), was a source of jealousy, envy and hostility, but also of intense admiration from his audience and peers alike. He wrote his music to elevate his prestige as a virtuoso, which sometimes proved too much for the more sensitive listeners, and for those who could not come to terms with his startling innovations on the instrument. Paganini’s critics and detractors did not hold back in their efforts to malign him. “Never has an artist caused such a sensation within our walls as this god of the violin. Never has the public so gladly carried its money to a concert, and never in my memory has the fame of a virtuoso so penetrated to the lowest classes of the population. When we say that in his hands the violin sounds more beautiful and more moving than any human voice, that his glowing sound kindly warmth in every heart, that every singer could learn from him, one has still said nothing that illuminates his playing – that is Paganini. His method of tuning. Paganini raised the pitch of all strings by a semitone and altered his G string alone when needed to a minor third higher. His use of harmonics. 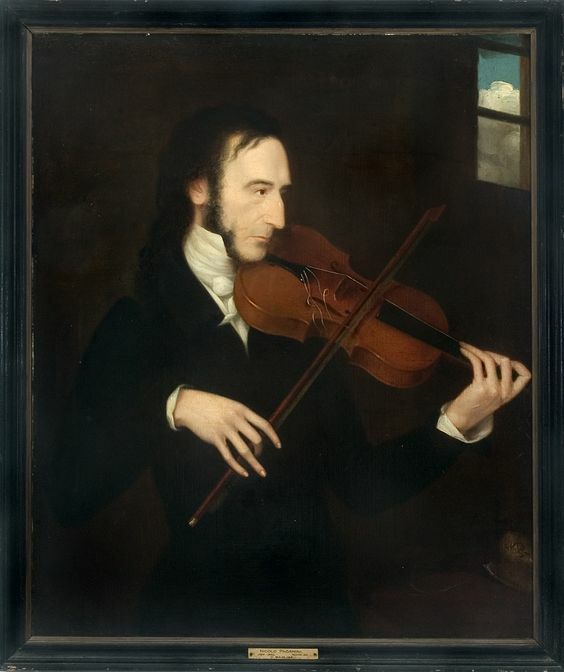 ‘One can say with certainty that much of Paganini’s security and clarity on the violin is directly related to his complete mastery and extended use of harmonics. This enables him to play with astonishing ease phrases that would otherwise be quite impossible on the instrument. Paganini’s Tour de Force. ‘I cannot be expected to describe them all, almost everyone who hears him for the first time is astonished and excited by so much that is new and surprising. Paganini can touch the deepest levels of the soul and perform unprecedented feats with dazzling perfection. The effect is far beyond description. It seemed that public opinion of him went up and down according to whatever rumours and stories were circulating about him at any given time, but despite the vicissitudes of his popularity throughout his career, Paganini had the innate gift of being able to surprise his audience. He wore a frock coat of dark grey which reached to his heels and gave him an appearance of great height. His long, dark hair fell to his shoulders in twisted locks and formed a black frame for his pale, cadaverous face, on which sorrow, genius and hell had left their ineffaceable stigmata. La Comtesse de Lamothe-Langdon described him as ‘a figure that looked almost twisted. His nose and mouth matched the rest of his appearance as did his deep set eyes that burned with a dark fire. All of this gave a look of the Satanic to his whole person.’ However, she goes to state that when he spoke of the violin and when he began to play, she no longer thought him ugly. In Paris, in the spring of 1831 Paganini put on a gala concert at the Opera House with the help of Rossini, (having declined to give a private performance for King Louis Philippe I on health grounds), where ticket prices were selling at double their normal price. The refined French School was more concerned with artistic expression than pure technique and blazing virtuosity, but Paganini had both in abundance – plus a generous helping of showmanship. In the audience were the musical, literary and artistic icons of the day: George Sand, Eugene Delacroix, Cherubini, Heinrich Heine and Franz Liszt. “Although this work carries the number 6 it is actually the earliest of Paganini’s surviving concertos. 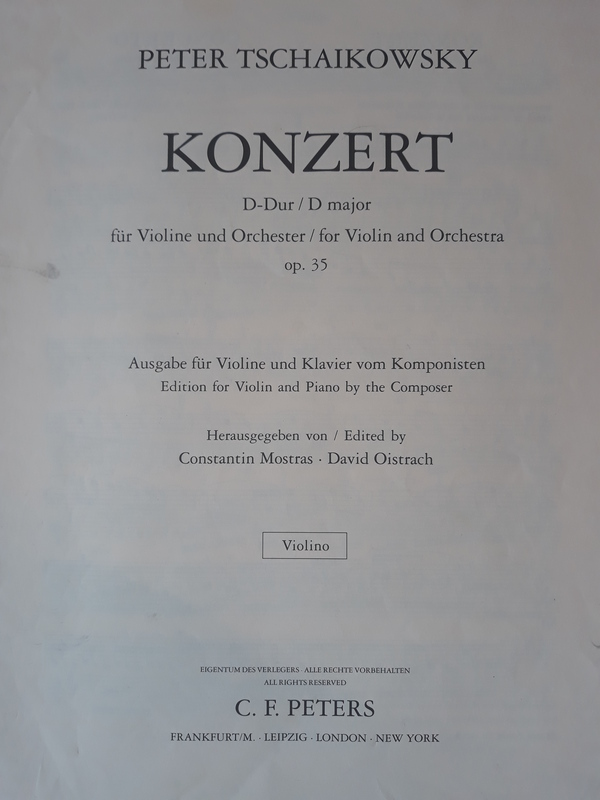 For a long time only a version for violin and guitar was available and Federico Mompellio and Francesco Fiore provided the orchestral accompaniment (published in 1973). After 8 concerts in 11 weeks Paganini was 158,000 francs richer, an incredible sum of money for a soloist to earn at that time. Following his stint in Paris he went to London and 151 concerts later made five times his weight in gold, even though his concerts sold at normal ticket prices. Paganini’s grand tour of Europe made him wealthy beyond all imagining, but sadly, towards the end of his life he made a disastrous investment in a casino that failed and ultimately cost him a fortune in excessive fines. 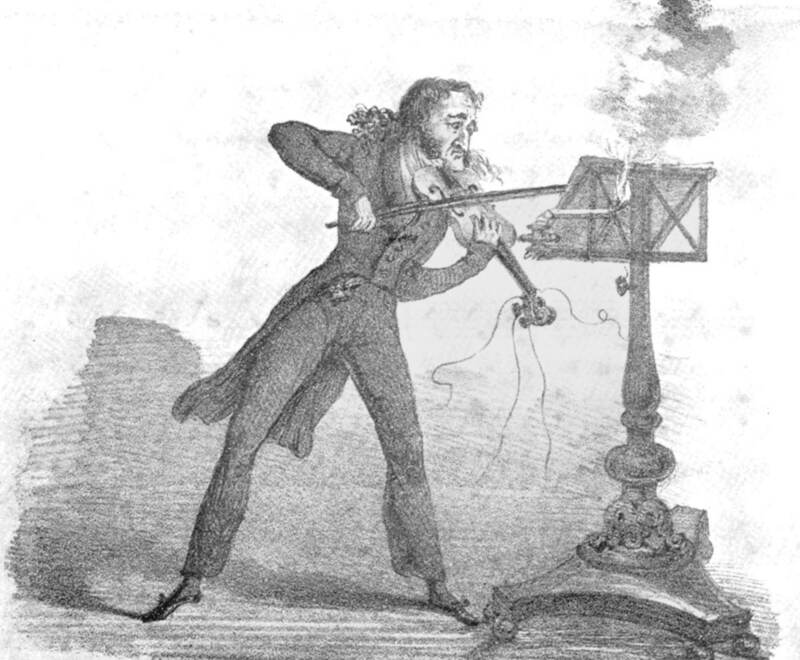 Paganini was impatient to see the music, and as soon as the first movement was finished, it was shown to him. He did not like the long silences. “That is not at all what I want,” he said; “I must be playing the whole time.” “You really want a concerto for the tenor,” Berlioz replied, “and you are the only man who can write it.” Paganini said no more, and soon afterwards left for Nice. Berlioz then gave free play to his fancy, and wrote the series of scenes for the orchestra, the background formed from the recollections of his wanderings in the Abruzzi, the viola introduced as a sort of melancholy dreamer, in the style of Byron’s “Childe Harold.” Hence the title “Harold in Italy.” Now, this is the point: “Harold” was inspired by Paganini, who indirectly gave a new art-form to the world. The piece was produced on November 23rd, 1834, but Paganini was then in Italy, and he did not hear it until four years later. In his frenzied state Berlioz went out into the bitter cold, met Armand Bertin on the boulevard, told him what had occurred, caught a chill, and again had to keep his bed. His powerful story became a legend, even in his own lifetime; fuelled by his incredible performances and quirky persona so that it took on a life of its own. Paganini’s legend has not simply endured, it has burgeoned into a mythical tale of tempestuous talent, suffering, greatness and infamy. It seems Paganini was possessed by his Daemon at the expense of all else, so despite his shortcomings and irrepressible ego, his musical greatness will never be forgotten. The recordings with Massimo Quarta and Orchestra del Teatro Carlo Felice di Genova are possibly the closest thing that we will ever hear to what Paganini may have sounded like when performing his violin concertos. 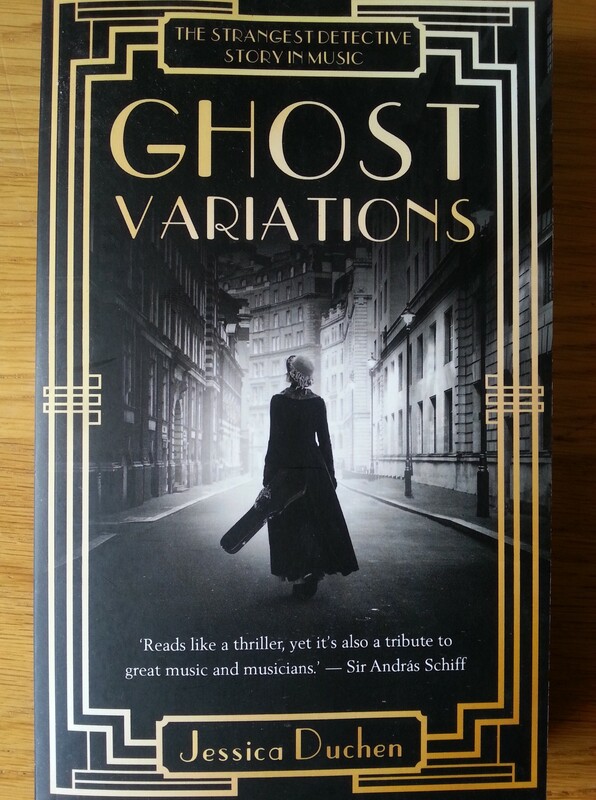 Ghost Variations: The Strangest Detective Story in Music is a perfect book for Halloween. 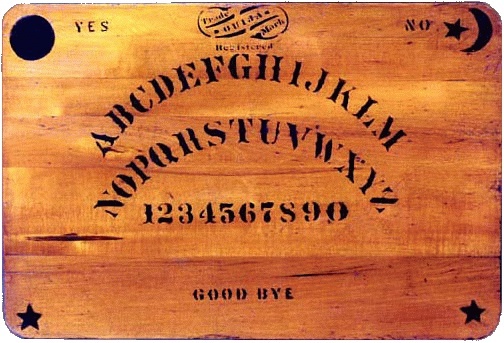 This book is not a traditional ghost story replete with creepy sounds that go bump in the night; Ghost Variations is derived from an actual occult experience in 1933, during which an important message from a genius musical spirit ‘speaks’ at a private séance conducted with a Ouija board. 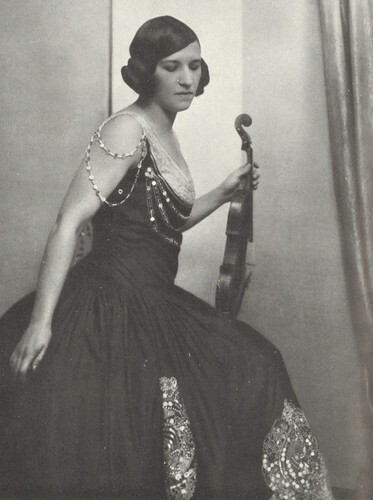 As I was researching the violin virtuoso Joseph Joachim, I came across Jessica Duchen’s fabulous novel, which is narrated predominantly from the point of view of the violinist Jelly d’Arányi, a siren Hungarian virtuoso, who as grand niece of Joseph Joachim, made a name for herself as a soloist based in London. I was totally absorbed in the book from the outset. It is beautifully written, impeccably researched, as well as being musically and historically authentic. The colourful characters (both real and fictional), come off the pages in high definition life. 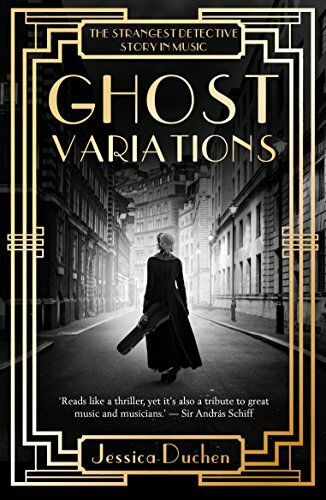 I read Ghost Variations in a handful of sittings; it totally drew me in to the fictional tale of this real life violinist – slightly past her prime – living an extraordinary life in the Art Deco zeitgeist. Based on her character in the novel I would love to have met Jelly d’Arányi. I feel Jessica captured her ‘essence’ perfectly: vivacious, glamorous, gracious, kind, musically brilliant but not a diva, vulnerable, courageous, and paradoxically both naïve and worldly. 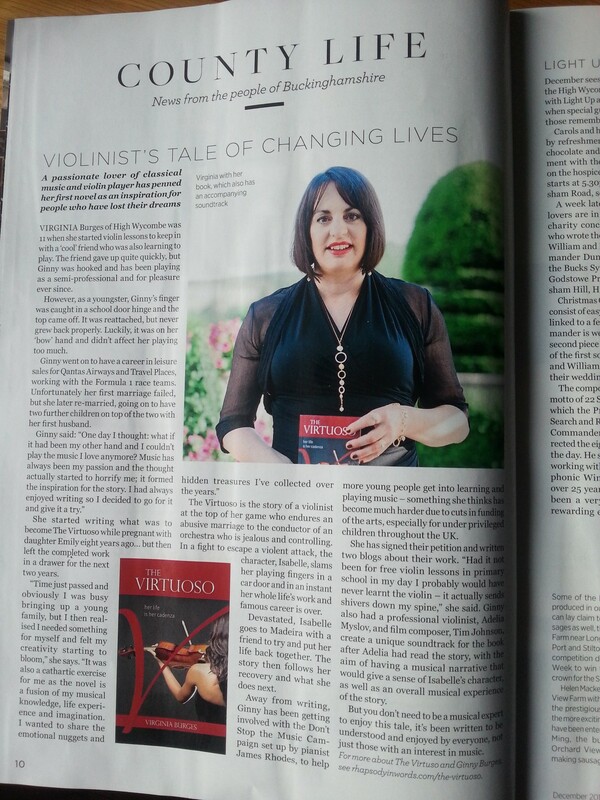 She has known love, but is dedicated to her Bergonzi violin and her art: music. The novel is set in the late thirties; Jelly is unmarried and approaching forty with arthritic joints that hamper her playing. She finds her own fame fading simultaneously with the rise of the young violin superstar, Yehudi Menuhin based in America. Jelly lives with her sister Adila Fachiri, her lawyer husband Alex, daughter Adrienne and pet dog Caesar in Netherton Grove. Their home is affectionately dubbed Hurricane House, a warm and bohemian base for Jelly as she travels across the UK for her paid concerts as well as a series of cathedral charity concerts during the depression. The story begins after a concert when Jelly, her secretary Anna and their hosts, play a glass game. Jelly, although skeptical, still takes part, but when the spirit of composer Robert Schumann mentions her sister, she gets cold feet and leaves the room. At first she cannot accept the spirit messages are real, and tries to put the episode out of her thoughts. However, events conspire and in a glass game with her sister Adila (known for her psychic abilities), and their close family friend and spiritualist, the Swedish Ambassador, Baron Erik Palmstierna, the voice of Robert Schumann comes through to Jelly, telling her to find and play his forgotten violin concerto. Although still troubled, this time, Jelly cannot ignore it. The paranormal nature of its emergence adds all the more mystery and conflict to the story, an imagining of what it must have been like for the talented Hungarian sisters in a time when psychic phenomena was frowned upon. Jelly and Adila start to research the concerto, the last significant composition by Schumann before he descended into apparent madness, written for their revered great uncle Joachim. After Schumann’s death alone in the sanatorium, Brahms, Joachim and Clara decide not to publish the work, and it is placed in the Prussian State Library in Berlin by Joachim’s heirs, with the instruction that it not be performed for at least 100 years. When Jelly tells her musical companions about the circumstances preceding its rediscovery, she is met with mixed reactions. Donald Francis Tovey decides that the music itself is the most important thing, not its method of discovery, and helps her locate the score with the help of established German publishers Schott. Meanwhile Jelly is losing another love, Tom Spring-Rice to a fatal illness (after having lost Australian Olympic athlete, pianist and composer, Sep Kelly during the First World War). She is emotionally fragile, and comes to believe that by performing the world premiere of a long lost violin concerto she can also regain her dignity and rediscover herself. However, in the wake of the baron’s visit to Berlin, knowledge of the concerto has come to the attention of the Nazi’s, who wish to use it for their own sickening nationalistic purposes, and the world premiere of the piece is awarded by Goebbels to a state sanctioned musician, Georg Kulenkampff, after it has been extensively edited by him, and also secretly by Paul Hindemith. There is a brilliant and chilling scene towards the end of the novel in which the Strecker brothers, Ludwig and Willy and their colleague Ulli Schultheiss from Schott meet with Goebbels and members of the Reich regarding its publication and performances. They know that their competitor Breitkopf & Härtel are also angling for first publication of the concerto, and so propose that Yehudi Menuhin also play it in America. Ulli puts his neck on the line to push for Jelly d’Arányi’s moral right to play the London premiere, being the grand niece of its dedicatee. Being the vile Nazi pig he is, Goebbels is unhappy with his suggestion and threatens Ulli with his demise; but he ultimately agrees, as the music will by then be in the public domain. Other scenes that reduced me to jelly (if you excuse the pronunciation and pun), is when she receives a visit from Moshe Menuhin, Yehudi’s formidable father. He brusquely asks her to give up the London premiere so Yehudi can be the first to play the concerto in London instead. Jelly refuses. After the publication of Horizons of Immortality by Erik Palmstierna in conjunction with Adila Fachiri in 1937, in which a whole chapter is devoted to the story behind Jelly finding the ‘lost’ Schumann concerto, there is a media frenzy and backlash against her, and Jelly’s nerves are shredded even before she is due to perform the London premiere with Sir Adrian Boult and the BBC Symphony Orchestra. As Hitler ramps up his anti-Jewish activities and propaganda, Jelly is subject to increasing racial animosity in London as her foreign accent is being noticed and commented on more frequently. The pre-war situation becomes more tense, but it is nothing compared to the vitriolic reaction to her revelation of ‘voices from the other side’. The man she loves is trapped in Germany, sitting in the Charlottenburg Opera House, dreading Kulenkampff’s world premiere on 26th November 1937, at which Goebbels and the Führer are also present; knowing deep down he must somehow escape the abhorrent pall of Nazi Germany. “If Kulenkampff and Böhm, those most rational musicians could not make sense of the concerto, how could anybody? And yet… within this musical jungle lay a naked beauty so exposed that it seemed almost indecent. 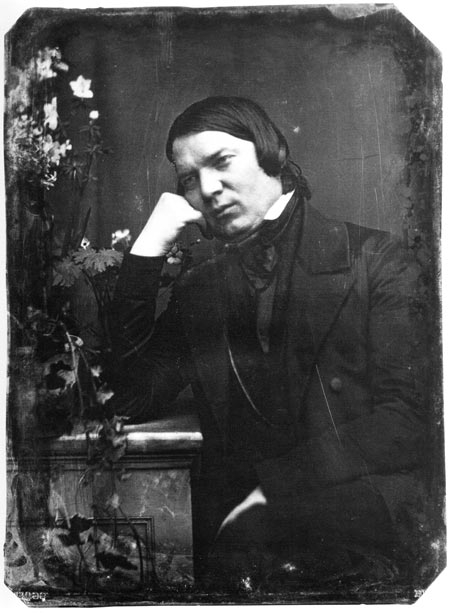 Schumann’s soul might be damaged and suffering, but he still gave its entirety. Could it ever have been right to leave this music unheard? The transition sounded and the Polonaise emerged into the daylight. The Führer was smiling. Ulli forced himself to listen to the detail. Kulenkampff’s version was considerably altered, wheras Yehudi had eagerly declared that he wanted to play every note exactly as Schumann had written it, without even the hushed-up Hindemith adaptations. Kulenkampff, ignoring Schumann’s funereal metronome mark, played it as a true Polonaise; yet though his delivery was graceful and elegant, its triumph felt empty. Everything would be alright, it seemed to say, when Ulli knew full well that it would not: only a few months after creating the blazing conclusion, Schumann threw himself off the Dusselforf bridge into the black Rhine. 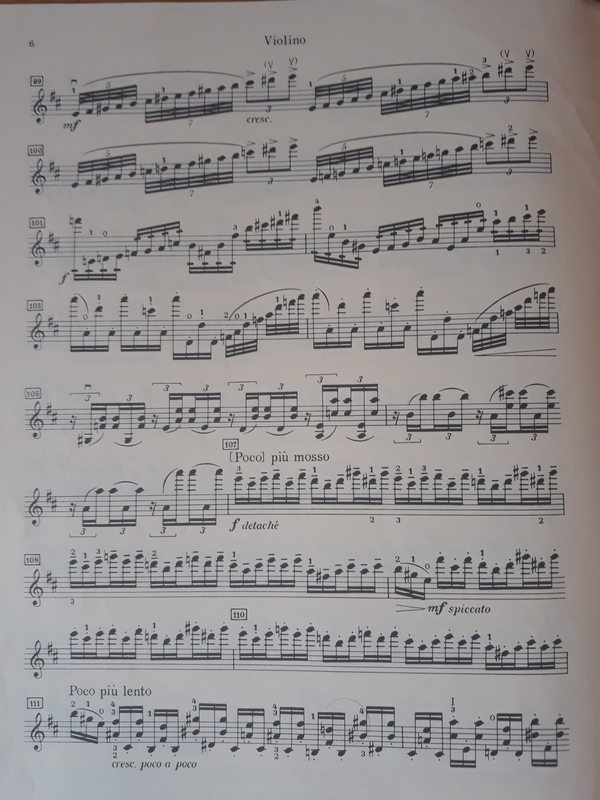 It is 16th February 1938, the date of Jelly’s London premiere of the concerto, described in a crescendo of emotion which has been building throughout the book; fascinating for musicians and non-musicians alike. Ghost Variations has a strong literary and musical theme, but it is written like a psychological thriller. This is something I also tried to achieve with my novel, The Virtuoso. I’m in awe at Jessica Duchen’s deft vocabulary and skill in layering in her protagonist’s emotional and musical challenges against the backdrop of a violent time in history: the two are clearly inseparable for Jelly. The novel leaves you rooting for victory and redemption for our gutsy heroine. We meet Jelly’s real cohorts in music, the larger than life pianist Dame Myra Hess and the indefatigable pianist and music professor, Sir Donald Francis Tovey. There are so many wonderful touches in the story, from how the sisters talk to each other in their everyday dialogue, the affectionate terms such as ‘Sai’ and ‘Onkel Jo’, to learning about how Bartók had written his violin sonatas for the sisters, and how Jelly had been muse to French composer, Maurice Ravel, who composed Tzigane, his gypsy themed, Czardas type melodies in his virtuosic showpiece for her. Jelly was also a muse to Elgar and Holst. Ulli’s greetings to the bust of Wagner at Schott’s headquarters in Mainz are entirely plausible, since the Strecker brothers’ father had actually been a close personal friend of the composer. Also in 1939, another previously unknown work by Robert Schumann was finally released to the public. It was a set of solo piano variations on the theme that Brahms had adopted from his own Opus 23 Variations (as played to Jelly by Myra in chapter 5). It became known as Geistervariationen – Ghost Variations – because Schumann believed the melody had been dictated to him in his sleep by spirits. What Schumann, in his disturbed state of mind, seemed to have forgotten is that he had already written the germ of this melody himself, in the slow movement of his violin concerto. He was writing the variations when he made his suicide attempt in February 1854. The day after his rescue from the Rhine, he gave the manuscript to Clara. She preferred to leave it unpublished. The suppression of the concerto after Schumann’s death was probably on balance a good thing, after all it led to a grand unveiling of a piece that may have been more maligned in the direct aftermath of Schumann’s illness, not to mention making a wonderful premise for a modern work of fiction! It’s as though Schumann’s spirit had re-emerged triumphant after eighty years to right the musical injustice of his unheard violin concerto in D minor. To put it using Sir Donald Francis Tovey’s vernacular from the novel: there’s no nuff and stonsense in this musical, literary gem! “She had to be no more tonight than the active component of her violin. No extraneous emotion – and no rustling dress – must upset the flow from Schumann’s mind to the audience’s. A musician is the truest medium there is. She, her technique and the Bergonzi were his channel now from world to world. Jessica very helpfully elucidates on which characters are real and which are fictional, as well as factual information about Jelly’s life and the fate of her family, friends and colleagues, at the end of the book, plus her extensive bibliography. It’s well worth reading, and was listed as John Suchet’s favourite read of 2016. Ghost Variations on Unbound. The name Joseph Joachim has been familiar to me for a very long time. I was aware that he was a celebrated and hugely virtuosic soloist, for I saw his name on many violin scores of other composers over the years as I progressed with my violin studies. He had either arranged the piece for the violin and piano part, or written a cadenza. His musical pedigree shone from the pages of multifarious scores, but other than that I didn’t know anything else about him. So here endeth much of my ignorance, as I attempt to shine the light of appreciation on Joseph Joachim’s life and achievements. Whilst Joachim was much more famous for his playing career than his composing (as many of my revered candidates in this violin/composer series have been), this Austro-Hungarian maestro was an early trailblazer of Beethoven’s Violin Concerto in D Major, and in a large measure responsible for its current popularity. I love him for that alone! His name is firmly established in the pantheon of violin greats; an exceptional talent on his instrument, and like many gifted musicians before him, he branched out into composing, conducting and teaching, where possibly his greatest legacy and influence still thrives. Joseph Joachim was born the seventh of eight children to Julius (a wool merchant) and Fanny Joachim on 28th June 1831, in Köpcsény, Hungary (present-day Kittsee, Austria). As an infant he survived the European cholera pandemic, which claimed almost 400 lives in the Pressburg region. When Joseph was two years old the Joachim family moved to Pest, then the capital of Hungary’s thriving wool industry. 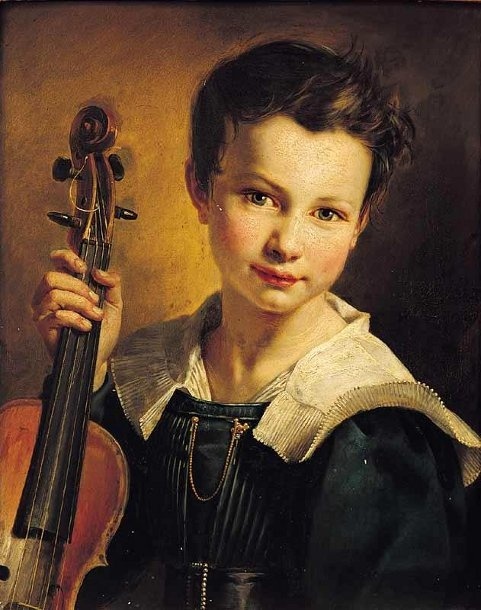 His older sister had stimulated an early interest of music in him from her study of guitar and singing, and a toy violin given to Joseph by Julius seems to have been the beginning of a lifelong love affair with the violin. Joachim’s cousin on his maternal side was Fanny (nee Figdor) Wittgenstein, who served as a surrogate mother to Joachim throughout much of his youth, mother of the industrialist Karl Wittgenstein, grandmother of the pianist Paul Wittgenstein and the philosopher Ludwig Wittgenstein. 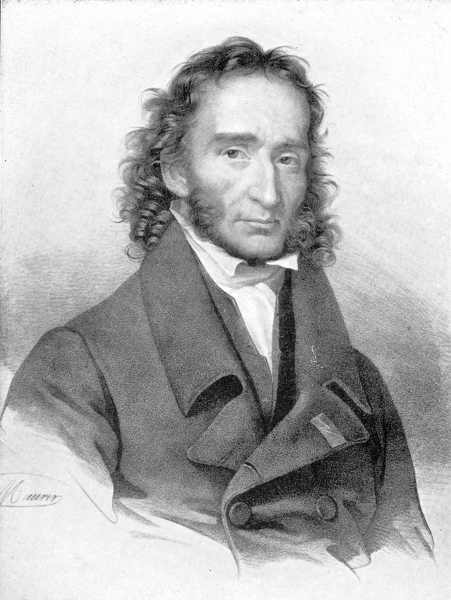 Joseph’s sister Johanna married Lajos György Arányi, a prominent physician and university professor in Pest who, in 1844, founded one of the world’s first institutes of pathology. 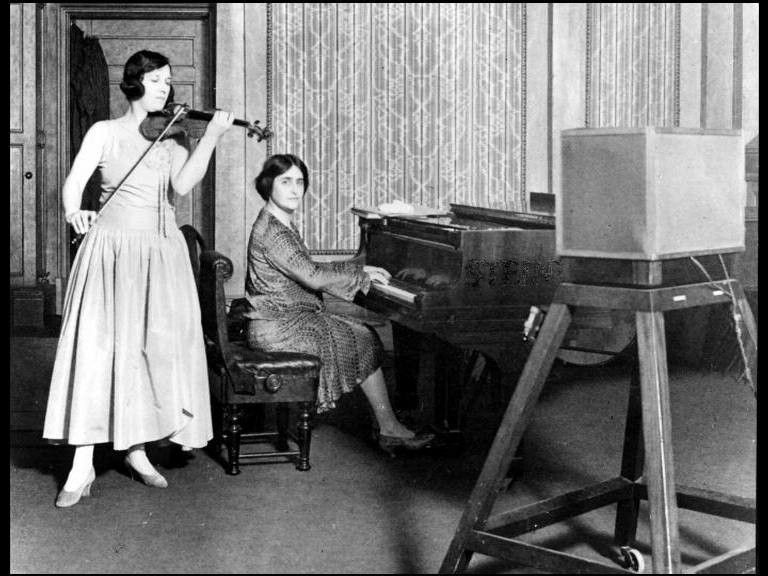 Their granddaughters (Jospeh’s grand neices) were the distinguished violinists Adila (Arányi) Fachiri (1886-1962) and Jelly d’Arányi (1893-1966). Both had studied under Joachim’s protégé, the eminent Jenö Hubay. Jelly d’Arányi is the protagonist of Jessica Duchen’s novel, Ghost Variations, a fictional tale around the true story of Robert Schumann’s long lost violin concerto, composed for her great uncle Joseph. This book is next on my reading list! Joseph’s brother Henry followed in the same trade as their father, and settled in England, where he married Ellen Margaret Smart, from a prominent British musical family. Their son Harold Joachim (nephew of Joseph) was educated at Harrow College and Balliol College Oxford. A respected philosopher and scholar of Aristotle and Spinoza, his most well-known book was The Nature of Truth, (1906). As an Oxford University professor he taught the American poet T.S. Eliot, who wrote: ‘to his criticism of my papers I owe an appreciation of the fact that good writing is impossible without clear and distinct ideas’ (letter in The Times, August 4, 1938). He was also said to be a talented amateur violinist and married to one of Joseph’s daughters. Harold’s sister Gertrude, (Joseph’s niece) married Francis Albert Rollo Russell, the son of British Prime Minister John Russell, and uncle of the philosopher Bertrand Russell. 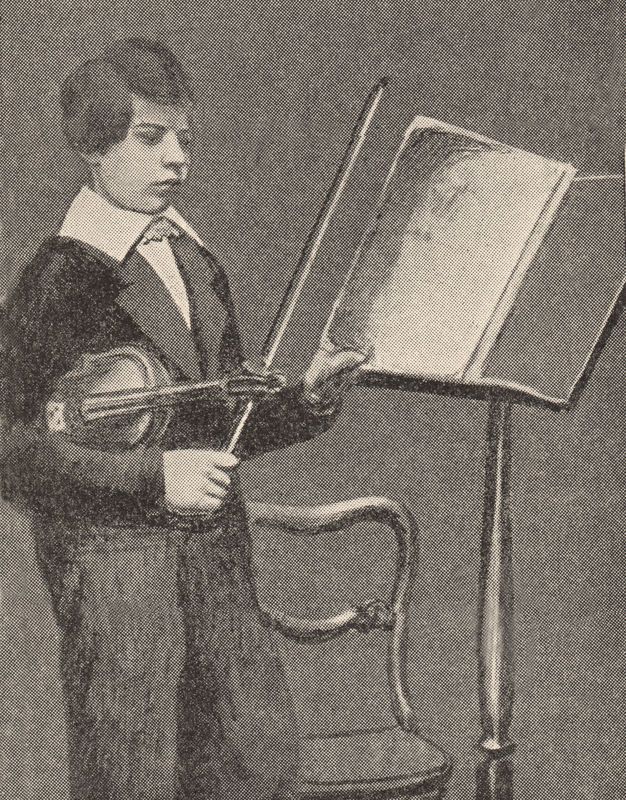 Joseph received his first violin lessons from Gustav Ellinger, a competent violinist but not the best teacher for the young prodigy, so Joachim’s parents’ placed young Joseph under the tutelage of Stanisław Serwaczyński, the concertmaster and conductor of the opera in Pest, who gave him a thorough grounding in the modern French School, by Viotti’s successors: Rode, Baillot and Kreutzer. An early debut in Pest brought Joachim to the attention of an important benefactor: Count Franz von Brunsvik, a liberal aristocrat and a pillar of Pest’s musical community, and also the affection of his sister Therese. The next stage of his musical development was to be in Vienna, where Joseph’s wealthy grandfather Isaac lived, as did his uncles, Nathan and Wilhelm Figdor. Joachim had a shaky start with teacher George Hellmesberger senior, who doubted Joachim’s future as a virtuoso due to what he considered weak and stiff bowing. At this point Joachim’s parents (who had been in Vienna for his concert), decided that they would return with him to Pest and seek a new profession for their son. Luckily for Joachim, the celebrated violinist Heinrich Wilhem Ernst was also in Vienna giving a series of highly publicised concerts, and when Joachim’s parents sought his advice he referred them to his own teacher: Joseph Böhm. Böhm proved to be the best mentor to further develop Joseph’s talent. He was well respected as the father of the Viennese School of violin playing. Joseph Böhm played in many historically significant concerts, including a performance of Beethoven’s 9th symphony under the composer’s direction. He became an early advocate for Schubert’s chamber music, and, on 26 March 1828, he gave the premiere of Schubert’s opus 100 trio. Together with Holz, Weiss and Linke of the original Schuppanzigh Quartet, he performed Beethoven’s string quartets under the composer’s supervision. For Joachim, this direct personal and musical connection to Beethoven held a great and abiding significance. Joachim’s training under Böhm was a true apprenticeship. In accepting him as a student, Böhm and his wife agreed to take him into their home just outside of Vienna’s first district, two blocks from the Schwarzspanierhaus where Beethoven had lived and died. For the next three years, for all but the Summer months, they would raise him in loco parentis, and train him in the practical skills of a professional violinist. Though not a violinist, Frau Böhm played a critical role in the Joseph’s musical upbringing, attending his lessons, and taking personal charge of his practicing. 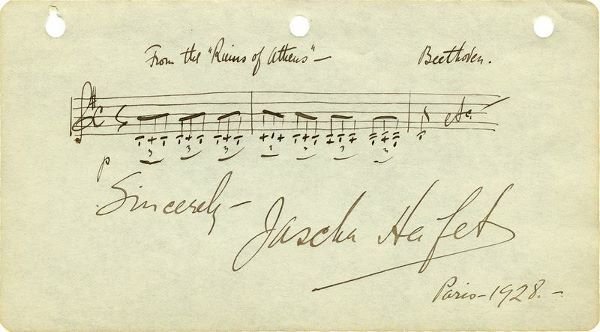 I find it fascinating how the connections emanating from Beethoven’s life through his compositions, fellow musicians, friends, acolytes and protégé’s seemed to go full-circle in the life of Joseph Joachim! 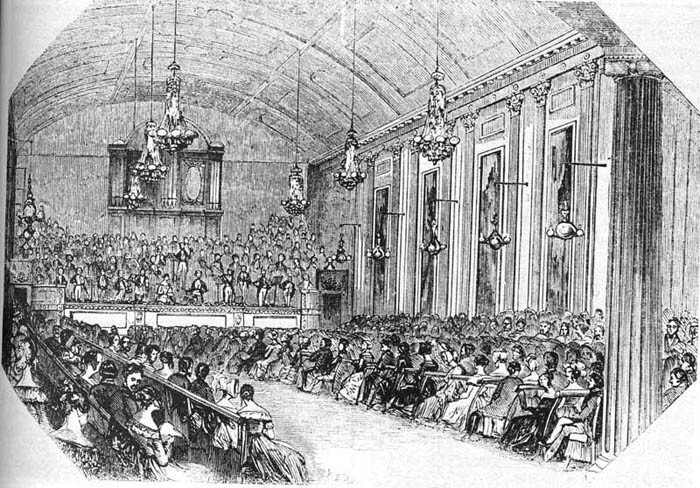 Shortly before his own recital on 30th April 1843, Joseph had the benefit of seeing the Belgian violinist Henri Vieuxtemps perform in Vienna’s Imperial and Royal Redoutensaal, no doubt an inspiring event. At his own recital to a burgeoning audience in the same venue, of the Adagio religioso and Finale marziale movements of Vieuxtemps’s fourth concerto in D minor, he made his debut with the Vienna Philharmonic. Joachim left Vienna in the summer of 1843 to further his studies in Leipzig, where he was to audition for the composer Felix Mendelssohn. Böhm relented, as his preference had been for his protégé to go to Paris instead. 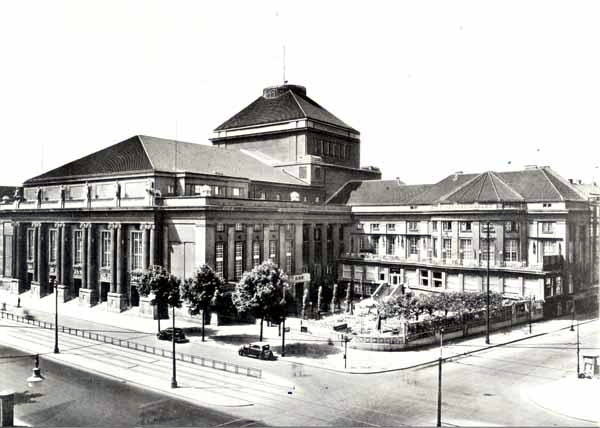 In August that year Joachim appeared in a Leipzig Gewandhaus concert, with Pauline Viardot-García and Clara Schumann, playing an Adagio and Rondo by Charles-Auguste de Bériot. Under the guidance and mentorship of composer Felix Mendelssohn, the thirteen year old Joseph wowed an enthusiastic audience in the Hanover Square Rooms on 27th May 1844, with his performance of the hitherto rather unfairly maligned Beethoven Violin Concerto. Vieuxtemps’s Beethoven performance had taken place in Vienna in 1834, but in London there had been no well received recitals of Beethoven’s only violin concerto. Ouch! Perhaps it is poetic justice that Spohr’s own violin concertos, which only were popular during his lifetime, never reached the current pinnacle of Beethoven’s much loved and enduring work. I wonder if Joachim realised all that was riding on his debut. Had he not played Beethoven’s ‘fiddling affair’ in such an outstanding manner, his career may have faltered and Beethoven’s only violin concerto may have forever remained in the shadows. That’s quite a lot of pressure to sit, even on the mature shoulders, of a young teenager. 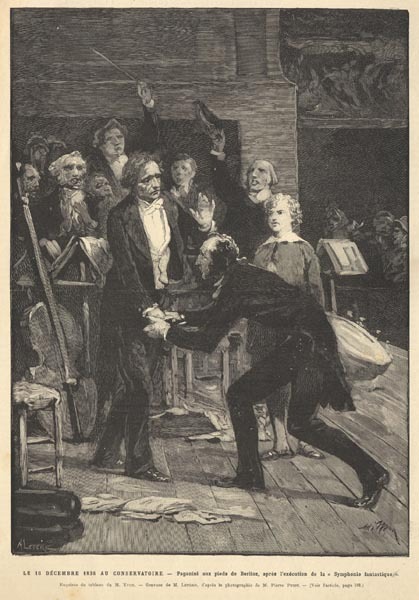 Mendelssohn had put his own reputation on the line, having been invited over as the guest conductor of the London Philharmonic Orchestra in 1843 and promptly suggesting the wunderkind Joseph Joachim to the society; who had a long-standing ban on child performers. Eventually, after a few high level auditions, it was agreed that Joachim would play the Beethoven Violin Concerto. Joseph was paid the sum total of 5 guineas (with a guinea being equivalent to one pound, one shilling). Quite a disparity with today’s performers, (inflation not withstanding), but it was to be the opportunity of a lifetime. “Joachim, the boy violinist, astounded every amateur. The concerto in D, op. 61… has been generally regarded by violin-players as not a proper and effective development of the powers of their instrument… But there arrives a boy of fourteen [sic] from Vienna, who, after astonishing everybody by his quartett-playing, is invited to perform at the Philharmonic, the standard law against the exhibition of precocities at these concerts being suspended on his account. As for his execution of this concerto, it is beyond all praise, and defies all description. This highly-gifted lad stands for half-an-hour without any music, and plays from memory without missing a note or making a single mistake in taking up the subject after the Tutti. He now and then bestows a furtive glance at the conductor, but the boy is steady, firm, and wonderfully true throughout. In the slow movement in C — that elegant expanse of melody which glides so charmingly into the sportive rondo — the intensity of his expression and the breadth of his tone proved that it was not merely mechanical display, but that it was an emanation from the heart — that the mind and soul of the poet and musician were there, and it is just in these attributes that Joachim is distinguished from all former youthful prodigies… Joachim’s performance was altogether unprecedented, and elicited from amateurs and professors equal admiration. On June 4th 1844, as news of his successful debut had spread, Joseph was asked to play for none other than Queen Victoria and the Prince Consort at a state concert in Windsor, attended by Emperor Nicholas of Russia, Frederick Augustus II, King of Saxony, the Duke of Wellington and Sir Robert Peel. He performed Ernst’s Othello Fantasy, and de Bériot’s Andantino and Rondo Russe, (the second and third movements of his violin concerto No. 2 in B minor), accompanied by the Queen’s private band, and received a golden watch and chain from the Queen for his efforts. 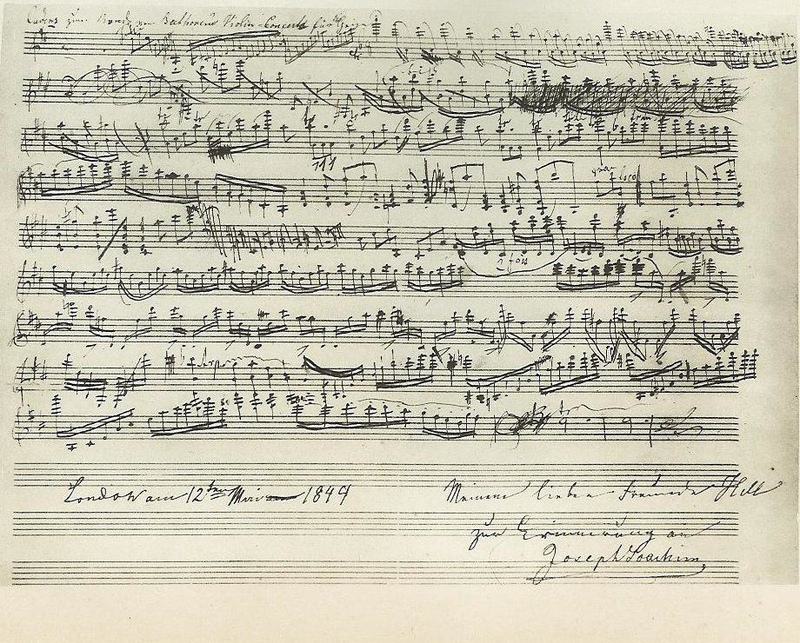 Mendelssohn’s sudden death in 1847 deeply affected Joachim, who was teaching at the Conservatorium in Leipzig and playing on the first desk of the Gewandhaus Orchestra with Ferdinand David. 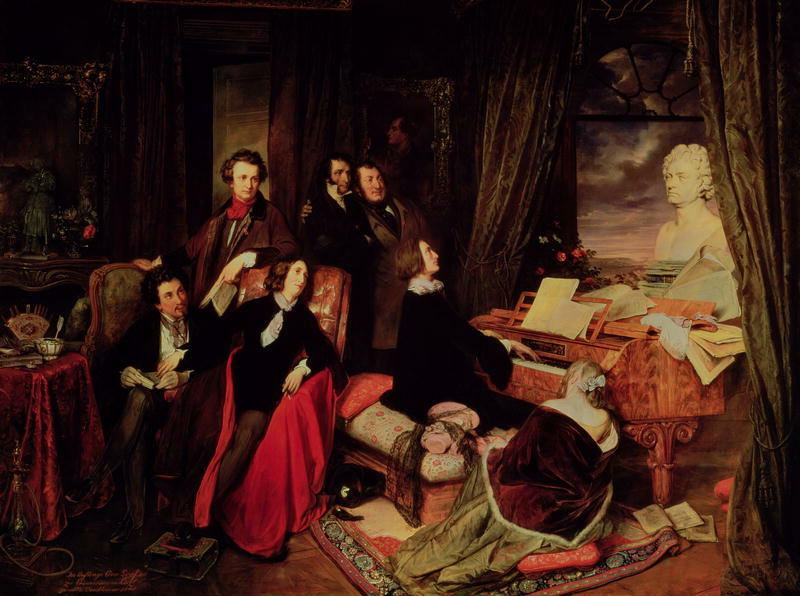 In 1848 the renowned pianist and composer Franz Liszt invited Joachim to Weimar (once home to Goethe and Schiller) to join his circle of avant-garde musicians, encouraging him to compose. Joachim served Liszt as his concertmaster and seemed to embrace the new “psychological music” as he put it. It was during his time in Weimar that he wrote his Violin Concerto in G minor, Op. 3, dedicated to his new mentor. Under the generous patronage of King George V of Hanover Joachim was well paid and given the freedom to compose and undertake concert tours of Europe. Joachim not only revived Beethoven’s Violin Concerto, but also championed Bach’s sonatas and partitas for solo violin BWV 1001 – 1006 and the much loved ‘Chaconne’ from the Partita No. 2, BWV 1004. Bach is staple canon for any modern violinist both pro and amateur. He studied the Mendelssohn violin concerto with the composer, and famously provided inspiration and composition feedback to Johannes Brahms, who wrote his Violin Concerto in D Major, Op. 77 for Joachim. He also performed his own version of Tartini’s Devil’s Trill and Robert Schumann’s dedication, Fantasy in C Major for Violin and Orchestra, Op. 131, previously unknown to me. Joachim and Clara Schumann undertook a recital tour in late 1857, performing in Dresden, Leipzig and Munich. They were also well received in London’s St. James’s Hall. Joachim performed yearly in London from 1867 to 1904. Through his friendship with Robert and Clara Schumann Joachim was able to introduce them to the twenty year old Johannes Brahms. They would all form a close and lifelong friendship, but not without their disagreements. 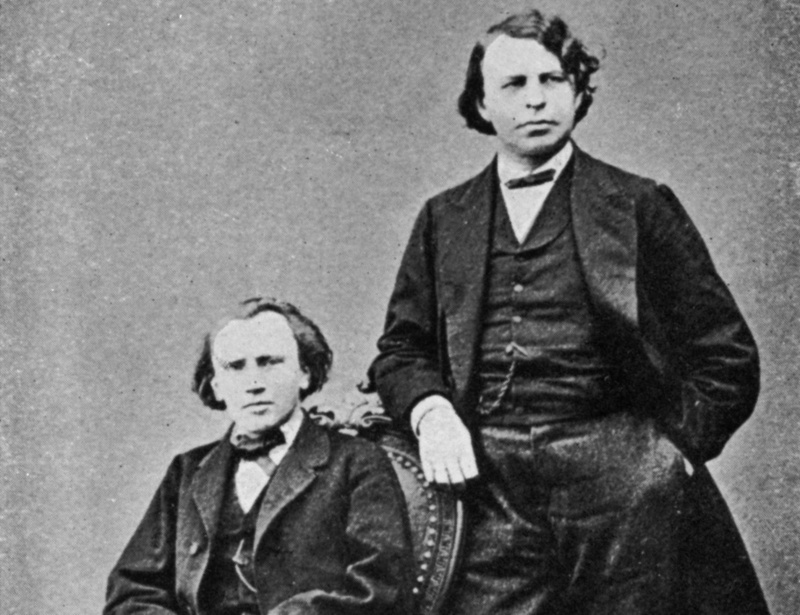 Johannes Brahms, German composer with Joseph Joachim. After many years of friendship and close collaboration, Brahms sided with Joachim’s wife at the time of their divorce. Joseph had accused Amalie of having an affair, but Brahms apparently had thought more highly of her chastity! Their rift lasted a year, and was mended, at least partially, when Brahms composed his Double Violin Concerto for Violin and Cello. Aside from his illustrious career as one of the most influential solo violinists of his era, Joachim also performed chamber works with his eponymous string quartet. They gave recitals of Beethoven’s late quartets – high in difficulty and low in popularity, at least until revival by Joachim and his quartet members: Robert Hausmann (cello), Joseph Joachim (1st violin), Emanuel Wirth (viola) and Karel Halíř (2nd violin). 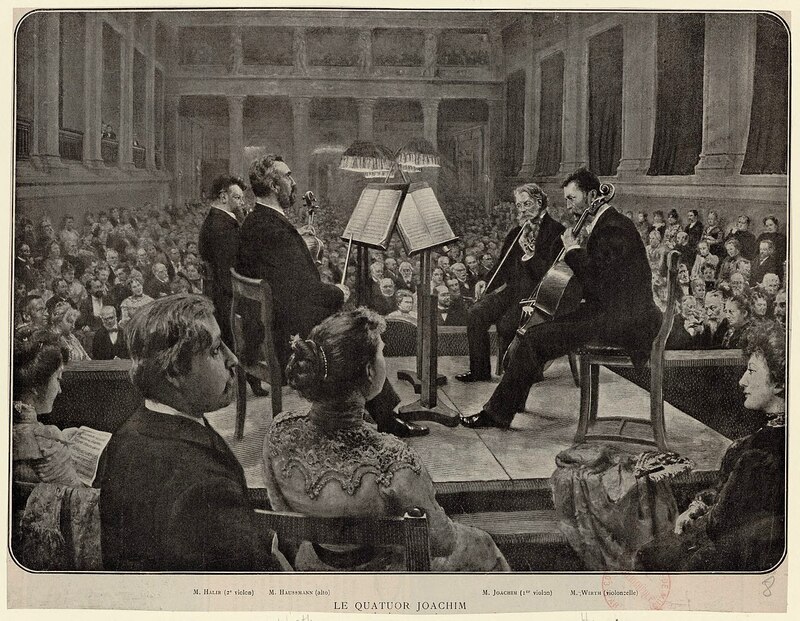 The Joachim Quartet was formed in Berlin in 1869 and quickly garnered a reputation as the finest quartet in Europe at the time. Joachim played in the quartet until his death in 1907. Please bear in mind that these recordings date back over a hundred and ten years and therefore sound scratchy and hissy by today’s standards, but they are just about clear enough to give you an idea of Joachim’s style. It’s also worth noting that he was 72 years old at the time of these recordings, playing with swollen fingers and gout, so not in his prime! The so called ‘Hungarian’ violin concerto was composed in the summer of 1857, considered one of the great romantic violin concertos, written in the style of Hungarian folk music, which to Joachim, was inseparable to gypsy music. Rarely performed, it has been described as “the Holy Grail of Romantic violin concertos” by music critic David Hurwitz. The concerto premiered on 24th March 1860 in Hanover and was published in Leipzig by Breitkopf and Härtel in 1861. The performance I’m going to share is by Rachel Barton Pine, a musician I admire very much. She recorded the work on the Naxos label in 2003 with the Chicago Symphony Orchestra to high acclaim. 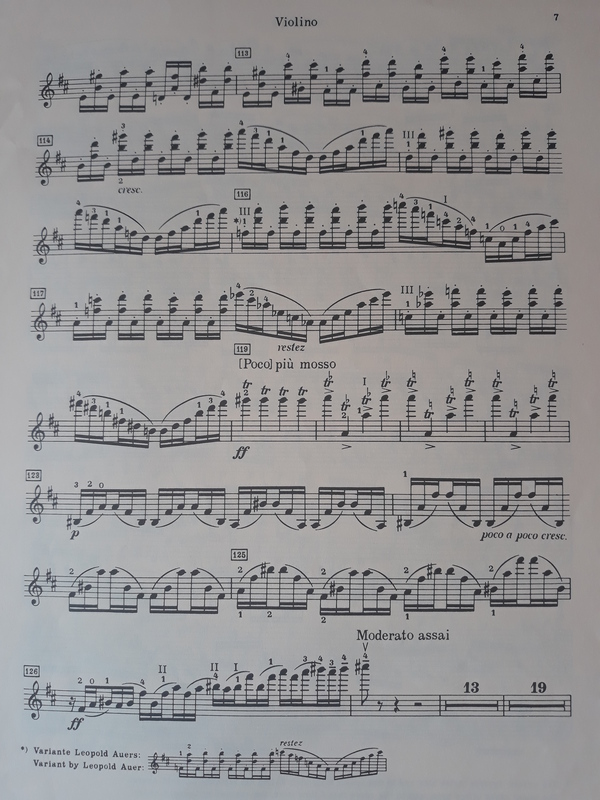 She was noted as saying that because the concerto is so challenging and lengthy (45 minutes+) practising and performing it was akin to “training to run a marathon”. In 1861, 17 years before Brahms produced his masterpiece in the genre, Joseph Joachim as a young virtuoso wrote his D minor Violin Concerto, In the Hungarian Style. He would later help to perfect the solo part of his friend’s work, but in his own concerto the solo part is if anything even more formidable, one reason – suggested in the New Grove Dictionary – that it has fallen out of the repertory. The Overture in C major by Josef Joachim, was composed in 1896 for the imperial birthday of the Kaiser of Germany. It was first performed on 3 February 1896 in Berlin’s Royal Academy of Arts. 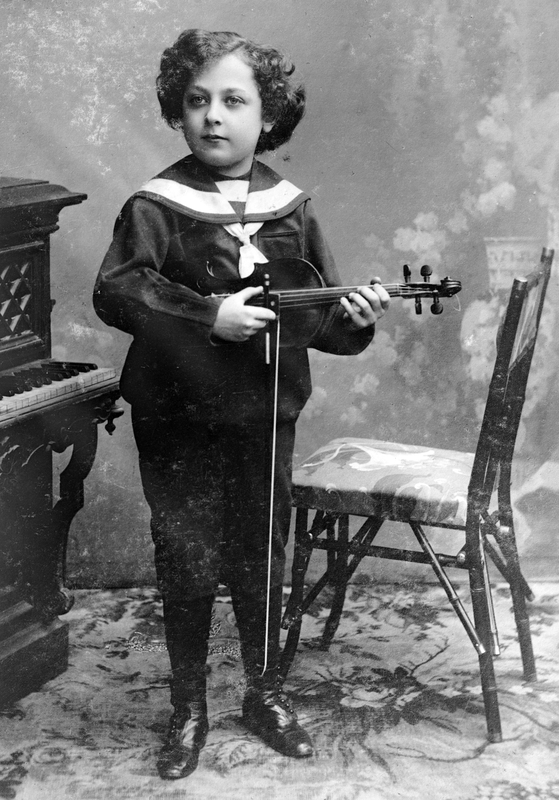 Probably Joachim’s most illustrious pupil was Leopold Auer, who himself went on teach some of the greatest violinists of the 20th century: Mischa Elman, Konstanty Gorski, Jascha Heifetz, Nathan Milstein, Toscha Seidel, Efrem Zimbalist, Georges Boulanger, Benno Rabinof, Kathleen Parlow, Julia Klumpke, Thelma Given, and Oscar Shumsky. Other prominent virtuoso violinists who were tutored by Joseph Joachim included Jenő Hubay, Bronislaw Huberman, Karl Klingler (violinist of the Klingler Quartet and Joachim’s successor at the Berlin Hochschule), Klingler was the teacher of Shinichi Suzuki. Franz von Vecsey, who studied with Hubay, then Joachim, became the dedicatee of the Sibelius violin concerto. Andreas Moser (another of Joachim’s pupils), went on to become his assistant, helping to recover the original scores of J.S. Bach’s Sonatas and Partitas for Solo Violin, collaborating with Joachim on numerous editions. 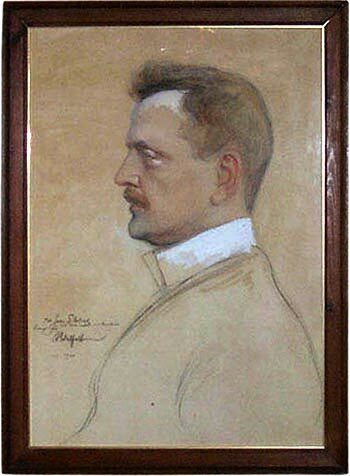 Moser wrote the first biography of Joachim in 1901. In March 1877, Joachim received an honorary Doctorate of Music from Cambridge University. For the occasion he presented his Overture in honor of Kleist, Op. 13. Near the 50th anniversary of Joachim’s debut recital, he was honored by “friends and admirers in England” on 16 April 1889 who presented him with “an exceptionally fine” violin made in 1715 by Antonio Stradivari, called “Il Cremonese”. The provenance of the ‘Cremonese, Harold, Joachim’ is given in full detail on the intstrument’s listing in Tarisio. Currently housed at the museum in Cremona, here is a 2013 recital of Bach by Antonio de Lorenzi, and it sounds georgeous! Joachim also played on the ‘Messiah’ 1716 Stradivarius which I have seen on display at the Ashmolean Museum in Oxford, on the list of the 12 most expensive violins in history. To my shame and consternation I have never played a piece of music by Vieuxtemps on my violin. I honestly wasn’t that familiar with his repertoire before reading up about him. I knew of him, but I had no idea just how beautiful and virtuosic his music really is. An outstanding virtuoso violinist of the romantic era, he mastered his performance craft and was completely in tune with what was and wasn’t possible on the violin; pushing soloists to their technical limits in his violin concertos. He had almost certainly been influenced by the brilliance of the famous violinist Paganini. The two met in London in 1834 when Paganini was in the twilight of his career and Vieuxtemps had given his debut in the city. Both were said to be mutually impressed with each other’s talents, but differed in their musical philosophy. If one could know a person through his creative output I would say that Vieuxtemps possessed a great love for the violin and wanted to explore what it was capable of within the parameters of aesthetic enjoyment. It seems that the virtuosity in his music is the epitome of his flair and improvisational skills, but it is never misplaced or garish. Although Henri Vieuxtemps, (literally translated as Henry ‘old times’) was incredibly popular during his lifetime his work has slipped into comparative obscurity today. His early development seems to follow a similar path to that of others I have written about in the violin virtuoso/composer series, in that he was a child prodigy from the age of four. Oh what it must be like to be gifted from the get-go! Henri was initially tutored by his father, a weaver by trade, but also an amateur violinist and luthier. Vieuxtemps made his first public debut playing a violin concerto by Pierre Rode aged six, and later came to the attention of illustrious violinist/composer Charles Auguste de Bériot at one of a series of concerts in Brussels and Liege. De Bériot became his private tutor and took the young Henri to Paris in 1829, where he made his debut with another Rode violin violin concerto. The July Revolution of 1830 in Paris and de Bériot’s marriage to Maria Malibran forced his return to Brussels where he continued to perform for a time with Pauline Garcia, de Bériot’s sister-in-law. During a tour of Germany in 1833 Henri met and became friends with Louis Spohr and Robert Schumann. He also garnered the attention and admiration of Hector Berlioz during his touring of various European cities. Now established on the European classical circuit Vieuxtemps also made three concert tours of the USA, firstly in 1843 – 44, in 1853 and again 1857 – 58. 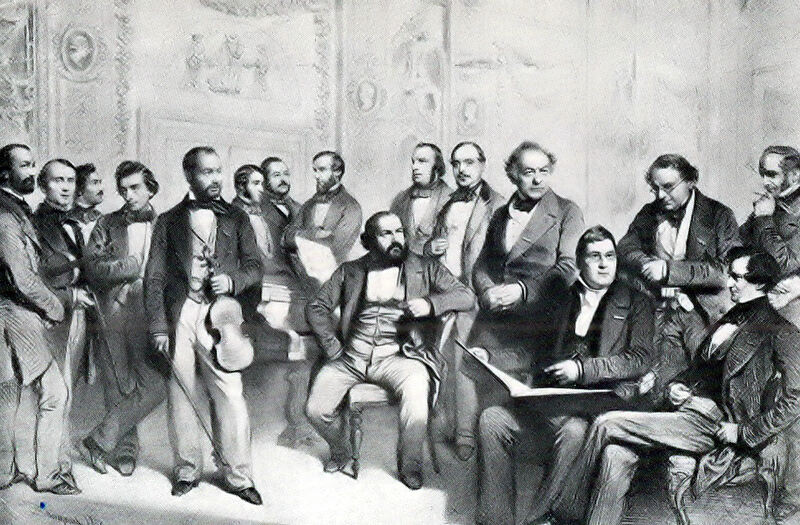 Henri Vieuxtemps standing (with his Guarneri violin), alongside noted musicians and composers who performed in John Ella’s 1853 season of the Musical Union. Louis Spohr is seated with his score, with Berlioz next to him. Perhaps it was the influence of traditional American folk music that inspired his composition of the ‘Yankee Doodle’ Souvenir d’Amérique. Not content with performance alone he studied composition with Simon Sechter in Vienna, after having performed Beethoven’s Violin Concerto in D Major as his debut in the composer’s home city. A mature work indeed for a tender teenager of fourteen, and a concerto he would champion throughout his career. He also became a pupil of Antonin Reicha in Paris. 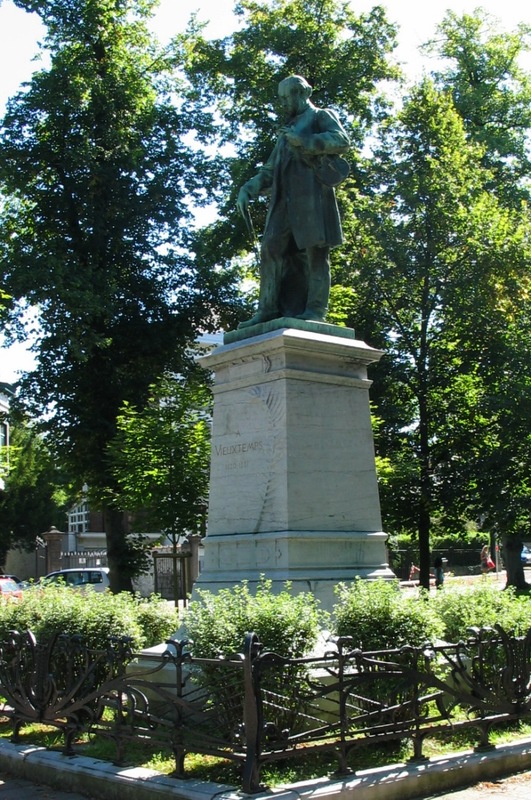 Vieuxtemps was an influential performer, composer and teacher, especially in the history of the Franco-Belgian School of violin during the mid nineteenth century. The school dates back to the evolution of the modern violin bow such as those made by François Tourte, often referred to as the Stradivari of the bow. What stood out for me listening to and discovering his violin music and overall oeuvre was the singing, ‘bel canto’ quality of the violin, especially in the higher registers. This is a quality that Tartini also embodied. The works aren’t overly violin dominated but encompass the entire orchestra in partnership with the violin and are richer for it. Whilst he may not be on par with Beethoven in terms of composition, (whom he admired and performed), alongside Bach, Mozart and Mendelssohn, he certainly used his intimate knowledge as a player to bring out the emotion, rising above the obstacles of technical difficulty. His violin music has a freedom to express emotion that is most endearing and attractive for a soloist; enabling a player to impart their own style and personality on the music. The most famous of his violin concertos was number 4 in D minor, composed while he was in Saint Petersburg as the court violinist to Tzar Nicholas 1 of Russia in 1846. 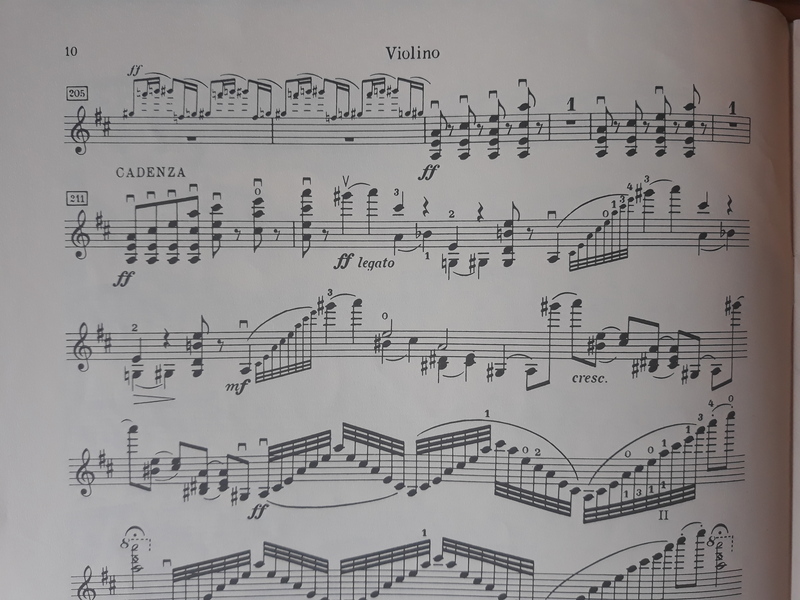 Unusually for a violin concerto it has four movements, which Vieuxtemps (rather astutely in his experience as a performer), advised that the challenging ‘off-beat’ third movement was optional for programming purposes. When the violin makes its expressive and singing entrance, free and interpretive, forward moving with increasing tempo and power in the higher notes, a certain forcefulness in the chords, virtuosity in the runs and harmonics – a drifting and energetic solo using the whole range of the instrument – you have a concerto worthy of immortality! To my mind it’s better and more complete with the 3rd movement included; said to be difficult even for professional violinists with its the tricky rhythm between soloist and orchestra, but at the same time lilting and lyrical with a rather playful quality, especially in Hahn’s gorgeous interpretation. The final runs in the 4th movement indicate a March like theme with impressive motifs and changing melodies. 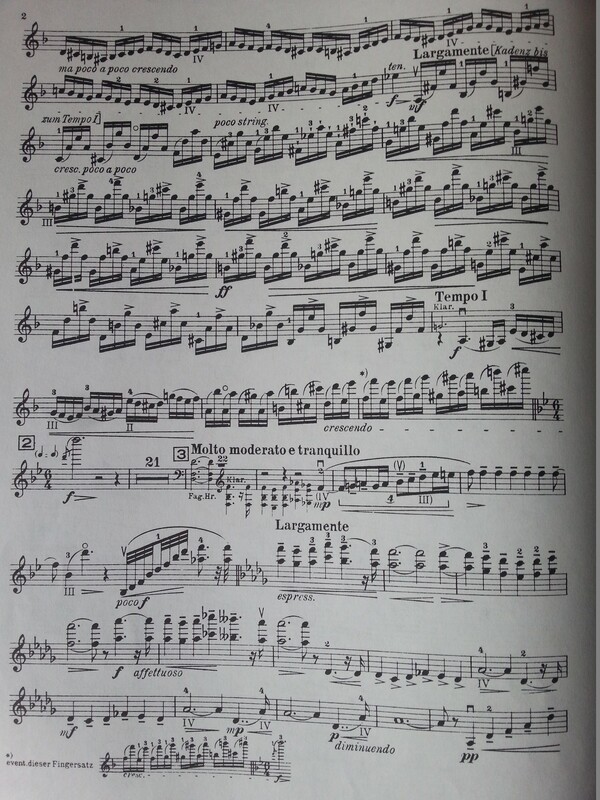 It’s what Hilary Hahn refers to as a ‘finger twister’! I am in awe of anyone who can play this concerto, especially the section in the finale that requires the fingers of left hand to move in alternating small and large increments whilst the right, bow arm and hand keep the pressure in the sweet spot so that 3 strings are simultaneously depressed; a violin multi-tasking mind bender!! Famed violin maker Guarneri del Gesù made the violin in 1741, three years before his death, and it was used extensively by Henri Vieuxtemps in his performances as a virtuoso violinist. Later musicians who played the Vieuxtemps Guarneri included Yehudi Menuhin, Itzhak Perlman, Pinchas Zukerman and Joshua Bell. 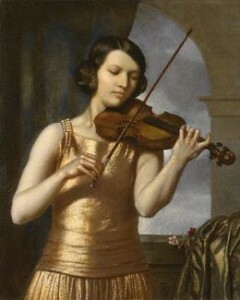 The violin’s excellent condition and undisputed provenance led to a steady increase in price and the instrument was sold to an anonymous buyer in 2012 by J & A Beares in London in conjunction with Paolo Alberghini and master violin restorer, Julie Reed-Yeboah. The final record-breaking price was said to be somewhere in the region of $16 million, with the purchaser gifting lifetime use of the ‘Viuextemps’ to the ecstatic virtuoso violinist, Anne Akiko Meyers. As Anne says, with other legendary violins owned and played by Paganini, Kreisler and Heiftez now resting largely unheard in museums, it is a precious gift to have the ‘Viuextemps’ being played on! News coverage of the sale by npr. Henri Vieuxtemps achieved great success and popularity in Russia. He made two concert tours there in 1837 and 1840 as well as his later 5 year stint at the Imperial Court. Perhaps his lasting legacy from his most revered time in Saint Petersburg (1846 – 1851), was his founding of the Violin School of the Saint Petersburg Conservatory and his early guidance of the ‘Russian School’. The teachers that followed him in Saint Petersburg were violin luminaries Henryk Wieniawski and Leopold Auer, whose students inlcuded some of the greatest violinists of the twentieth century, such as Mischa Elman, Jascha Heifetz, Nathan Milstein, Efrem Zimbalist, Georges Boulanger, and Oscar Shumsky. I feel strongly that Henri Vieuxtemps deserves more recognition and to be heard regularly on stage and in recordings. I hope you have enjoyed his music as much as I have during my venerative Vieuxtemps interlude! At 7.51 am on Friday 12th January 2007, an unassuming lone male figure dressed in a long sleeved T-shirt and baseball cap played the most spiritually uplifting violin music there is, on a £3.5 million Stradivarius, to oblivious passing commuters at the L’Enfant Plaza on the Washington Metro. Normally classical music fans, and in particular, violin aficionados pay around $100 to attend a Joshua Bell concert, for the chance to listen to one of the greatest living violinists. 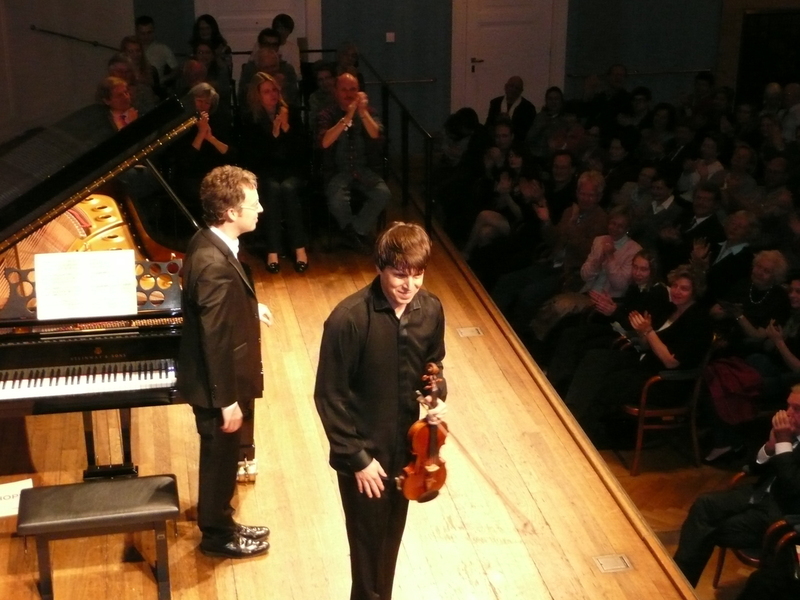 The experiment was thought up by Joshua Bell and Gene Weingarten, a Washington Post journalist, curious to see if someone of Joshua’s fame and reputation would elicit large crowds and a hefty amount of coinage in his case. The outcome of the 45 minute busking session was shocking – of the 1097 people that passed by Joshua that morning, only 7 people stopped to listen for a minute or longer, and the ones who tended to want to stop most were children. Joshua had received little over $32 for the entire session. For lesser virtuoso’s that kind of reception would likely have cleaved a severe dent in their ego, but Joshua Bell, I think, was able to look objectively at what happened. 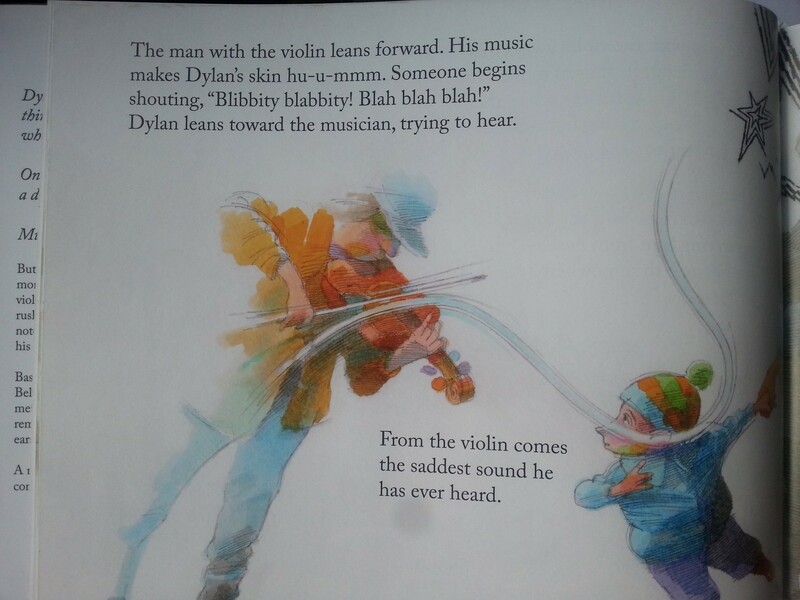 It had no bearing on his skill on the violin. It had everything to do with perception, placement and people’s capacity to enjoy something despite its context and their preconceived ideas. Buskers, although many are highly talented, are not usually in the same league as a concert soloist. We tend to disregard them unless we like what we hear. No matter their skill level my children always stop for buskers. It was early in the morning and people were naturally rushing to work so they weren’t really focused on anything else. The dismal results highlight how often we can live in a kind of manic, 21st century stress bubble. Our schedules are crammed to the hilt; we don’t appear to have a nanosecond to enjoy the finer things in life. But such a blinkered attitude means we miss out on what’s really around us. It’s time to open up our awareness and take a deep, abdominal sniff of the roses – really smell and devour their glorious scent – make it a part of us. 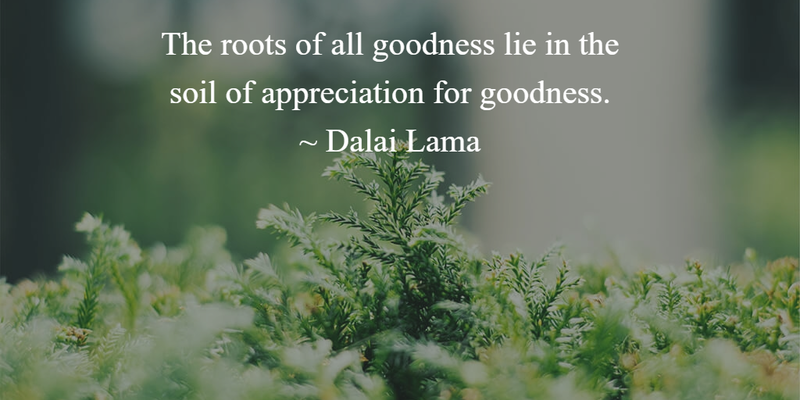 Let that divine aroma mingle in our blood as it pulses around our body and nourishes our cells. Stop and listen to the music if you can, it’s highly beneficial for human beings. Pause and appreciate a work of art, read an excerpt of a classic text and truly digest what message, what heart-felt passion and skill went into its creation. One of the best violinists in the world was playing music that speaks to the soul on a Golden Period Stradivarius, and barely anyone could truly appreciate it. This wasn’t just any old music played on a shoddy instrument by an amateur – this was mastery – mastery of composition, of violin construction and musicianship. It makes you think what else we might miss if our radar isn’t attuned to art, nature, beauty, literature and music, our whatever it is that elevates our soul. The universe is ‘speaking’ to us all the time, but are we listening? Many opportunities for joy may pass us by if we are in a kind of awareness stupor, only concerned with the banalities of life. 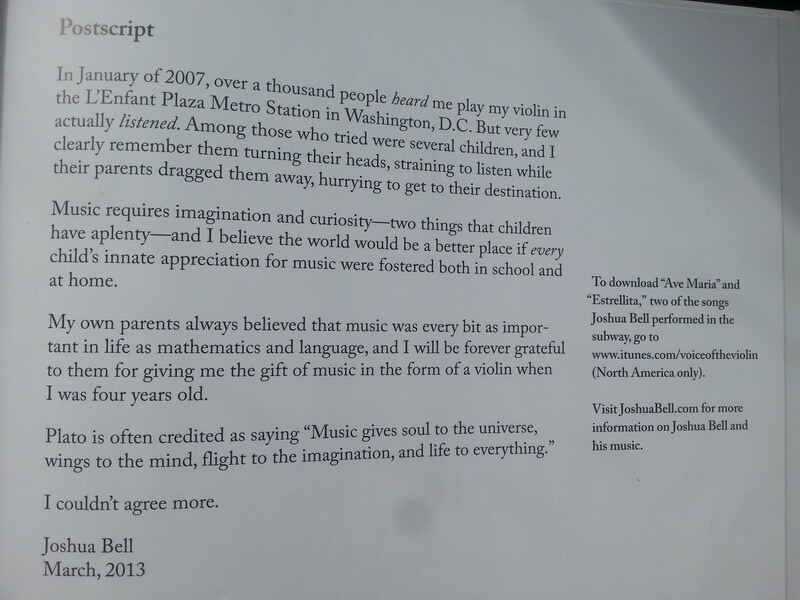 To be fair, maybe some people didn’t recognise or know who Joshua Bell is; but surely the heavenly music would have roused them from their cultural cocoons for just a minute? It’s a sad day when a person’s life is so devoid of feeling or joy that they cannot spare such a short time to enrich it. Here’s the article that Gene wrote after the experiment in the Washington Post. 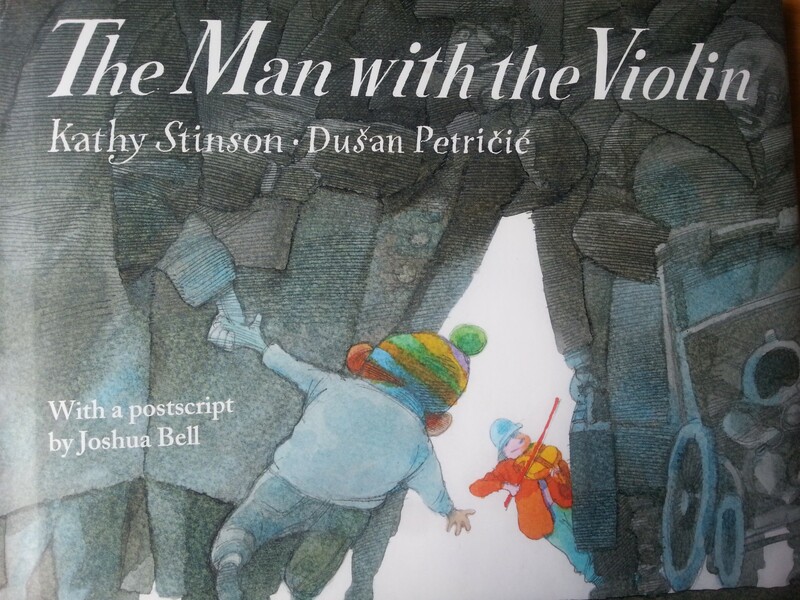 The experiment prompted children’s author Kathy Stinson to write a glorious book about it: The Man with the Violin. Kathy put herself in the shoes of one of one of the children who may have passed Joshua that cold wintry morning and wrote it from a young boy’s point of view. When I discovered this book I had already seen the experiment and knew that my daughters would love it. They do, and so do I, because it reminds me to pay attention to what my children pay attention to, and to live in and enjoy the moment. It’s beautifully written with a beautiful message and evocative illustrations. One of the lessons of this enlightening experiment was context. 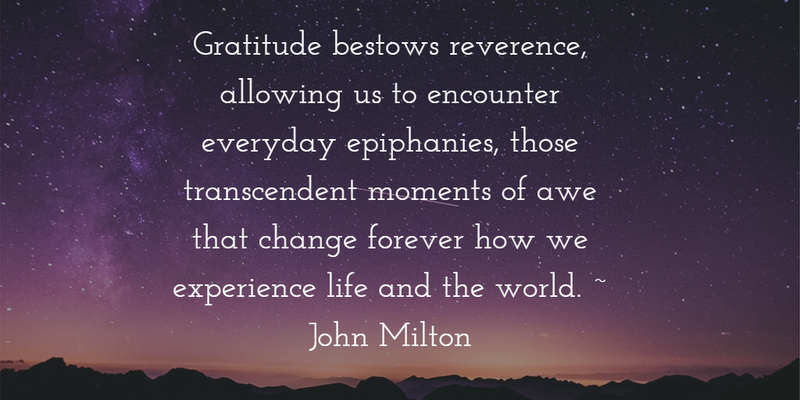 It turns out that time and place matter, that expectation has an impact on our experience and enjoyment. When we have paid a considerable amount of money to sit in a concert hall and hear the amazing acoustics of a hotly billed soloist we are in the right frame of mind to get the most out of that experience. Spontaneity is not something that the majority of people who passed him seemed to possess. It also demonstrated that people tend not to value something unless they pay for it. His follow-up performance at Washington Union Station in 2014 was much more successful! It helped that the event was publicised, so people knew in advance what was happening. I love his passion for children to have a musical education and how that impacts on their lives as well as their test scores. Music (of any kind) is not a nice to have, it’s as essential as maths and literature. It’s fundamental to our well-being on a mental, emotional, physical and spiritual level. So whatever floats your boat, be it music, literature, art, or being in nature, take time to enjoy it and let its beauty infiltrate your life and revitalise your soul. When a composer and a musician are both emotionally and musically in tune, the result can be an unforgettable recording that speaks to your soul. Such heart-felt performances usually manifest in glorious interpretations that create some of the most legendary, memorable, mind-blowing and totally magical moments in musical history. I’ll probably post these pairings as and when I become struck by their brilliance. 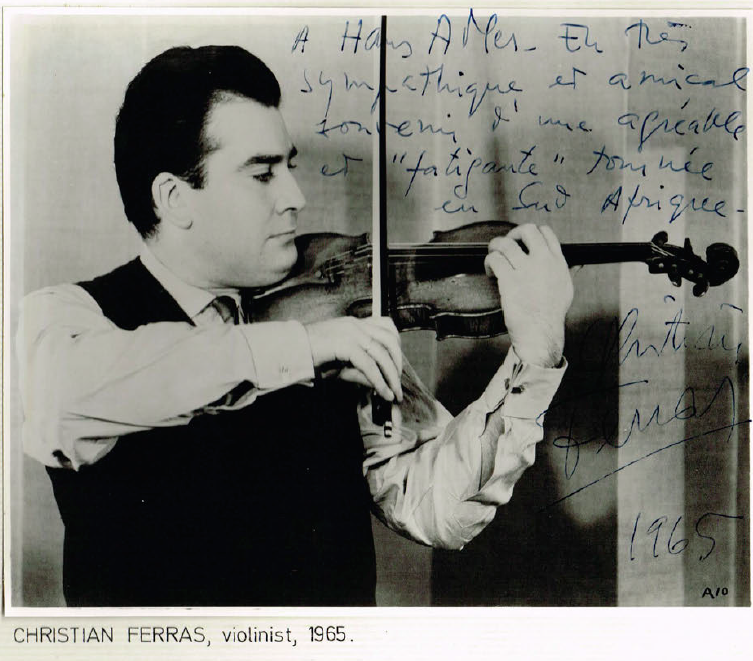 For my first example I feel compelled to share a performance by the late French violin virtuoso, Christian Ferras. Photograph of Ferras taken on a tour of South Africa, dedicated to the organiser Hans Adler. I recently learned of his existence (I know right, how can a violinist not have heard of Christian Ferras), and I’ve been completely captivated by his talent and romantic Gallic style. For me, he’s up there with Heifetz, Menuhin, Oistrakh and Perlman. This has been a musical discovery to relish and to cherish. I was impressed with many of his performances, but the one that stood out the most was his vintage recording of the melancholy Sibelius Violin Concerto in D minor. There are many wonderful recordings of this lyrical, challenging and thrilling work, but none have reduced me to rubble in quite the same way as Monsieur Ferras! My emotional defences were penetrated and disarmed by the honest, visceral and virtuosic nature of this particular mid 1960’s performance, under the baton of the young Indian maestro Zubin Mehta. You may not agree with my musings after listening and viewing, (not everyone does, as per this review in Gramophone), but to me this sublime rendition is full of beauty, passion and pathos. In the Adagio di molto he has tears streaming down his face. Maybe he was suffering from a broken heart and the music ‘spoke’ to him. It oozed out of his eyes and his bow, his fingers and his soul via his Stradivarius. There is a mournful purity to his sound that cannot be matched. Sibelius and Ferras is truly a match made in heaven. 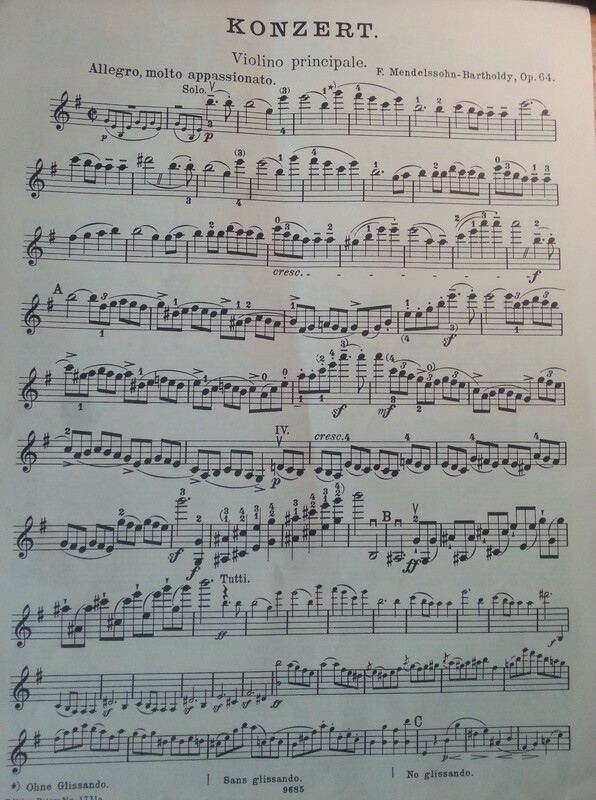 A section of the beautiful 2nd movement from my score. Perhaps the ‘dark’ melody of the Sibelius violin concerto was what resonated with Ferras’s lugubrious temperament. The Allegro moderato (1st movement) and the allegro, ma non troppo (3rd movement) are exhilarating and electrifying. I think it helps to understand why this is such a powerful, timeless performance when you know that Sibelius poured his love of the violin into this now popular and widely performed concerto in the classical violin repertoire. As a young man Sibelius had dreams of being a violin virtuoso and could play the Mendelssohn violin concerto, but his course changed after he failed his audition for the Vienna Philharmonic due to stage nerves. Perhaps that’s why he wrote his only violin concerto, as an expression of that deeply held, but ultimately thwarted dream. What may have felt like a disaster at the time may have turned out to be a blessing in disguise. His true gift however, was expressed through his writing of music. He may not have made such an impact on the world had he stuck to performance alone, but his compositions will never fade. An icy image of nature is a good to have in mind when listening to Finnish composer Jean Sibelius’s Violin Concerto in D minor, Op. 47, completed in 1903 and revised in 1905. The reason for revision is that the 1904 premiere was largely unsuccessful since the concerto proved too difficult. The 1905 version is considerably less challenging and also perhaps less cluttered. The concerto starts with soft strings supporting a tranquil and noble solo violin melody. As the music continues, the violin grows more impassioned and suddenly drops from the highest to the lowest registers of the instrument. The violin part grows more and more virtuosic as the orchestra is given an increasingly active role. 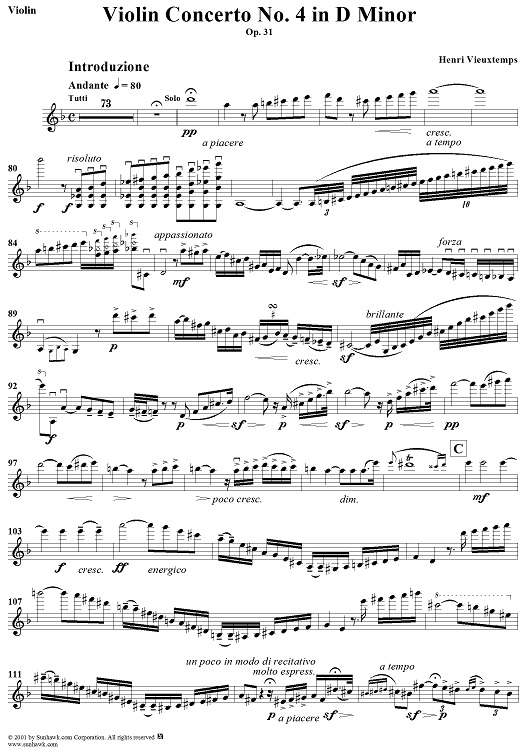 After a dark second subject in the orchestra, a passionate motif played in parallel sixths in the extreme upper register of the violin, and then a “travelling” theme in the orchestra, the orchestra stops, the exposition (the first part of a traditional sonata form movement) ends, and the solo violin begins an extensive and extremely virtuosic cadenza. In this sonata-form movement, the cadenza takes on the role of development (the middle section of the sonata form where the composer takes existing musical ideas and transforms them in inventive and interesting ways). The recapitulation (a varied repetition of the exposition) starts even before the cadenza ends, easing us back into the first melody. The movement closes in a brilliant coda with virtuosic violin octaves and inspired counterpoint fusing previously heard themes together. After the cold intensity of the first movement, the concerto’s second movement provides some degree of relaxation after a melancholic introduction in the winds. We now hear a warm, singing melody in the violin’s lowest register accompanied by horns and bassoons. The largely lyrical movement provides contrasts excellently with the brilliance and relentlessness of the outer two. The third movement follows the adagio with relentless dance rhythms; some critics note that these “long-short-short-long” rhythms are similar to those found in polonaises, a popular type of dance from Poland. The connection to dance is made even clearer by Sibelius having reportedly described the movement as a “danse macabre” — a dance of death. The dance is combined with intense virtuosic elements in the violin. The violin’s parallel octaves coupled with heavy orchestration bring the dance to a close. The initial version was noticeably more demanding on the advanced skills of the soloist. It was unknown to the world at large until 1991, when Sibelius’s heirs permitted one live performance and one recording, on the BIS record label; both were played by Leonidas Kavakos and conducted by Osmo Vänskä. The revised version still requires a high level of technical facility on the part of the soloist. The original is somewhat longer than the revised, including themes that did not survive the revision. Certain parts, like the very beginning, most of the third movement, and parts of the second, have not changed at all. The cadenza in the first movement is exactly the same for the violin part. Some of the most striking changes, particularly in the first movement, are in orchestration, with some rhythms played twice as slow. Christian Ferras was known to have been plagued with lifelong depression, a condition that tragically drove him to commit suicide on 14th September 1982 (aged 49) at the height of his career. He was one of the pre-eminent violin virtuoso’s of the late 20th century, but his untimely death seems to have curtailed his stardom in a way that never happened with his contemporaries. He just wasn’t around long enough. I’m doing my bit to raise awareness of his recordings; such a talent should never be forgotten. I’d love to hear what you think. Does this performance get inside you like it did me? If not, are there others that grab you in a similar way as the one I have waxed lyrical about between Ferras and Sibelius? Jascha Heifetz needs no introduction to anyone familiar with classical music, or a fan of the violin; but out of respect to a great artist, here goes. There will be more than a hint of hero worship! As far as violin playing is concerned, he reached the peak of Mount Olympus. There wasn’t anything he couldn’t do. He was, quite simply, a legend in his own lifetime. Many believe he has done more than any other 20th century violinist to elevate the standard of modern violin playing. But, paradoxically, he wasn’t all about technique. He was that rare breed of musician that transcended the physical boundaries of his instrument and became a true artist. Artistry for me, more so than technique is what sets him apart from other violinists. He took all the skills that were available to him, boundless natural talent, hours of practice, his almost flawless technical skill, emotional and mental mastery, and molded them into his individual, personal style, his unique artistry. He was blessed with divine ability on the violin, which was brought about in a most heart-warming way. As a baby he would cry while his father was looking after him and he did not know how to calm him. Being a professional violinist and concert master of the Vilnius orchestra, (now in Lithuania), Rubin Heifetz would play his violin to baby Jascha, and it stopped him crying! We should never underestimate the impact of early exposure to music on a human being. Whether they grow up to be one of the greatest musicians the world has ever seen or not, its benefits are immeasurable. The celebrated violinist Fritz Kreisler commented after hearing Heifetz’s debut in Berlin, “The rest of us might as well take our fiddles and break them across our knees!” From Kreisler! In a letter from his father to his uncle, when Jascha was just 10 years old, his father talked of the praise that had been showered on his son, not just by his teachers, but by the St. Petersburg press and musical community, who had been gushing over him after his first professional recital, saying that he was unique, not just in Russia, but in the whole world. The weight of expectation was firmly on his young shoulders. His name has become synonymous with excellence. Many musicians, regardless of their instrument, have heard the scathing phrase: “He’s no Heifetz!” The great cellist, Pablo Casals was dubbed the ‘Heifetz of the cello’. Pretty much every performance of Heifetz’s is a masterclass in violin mastery and perfection. Jascha Heifetz’s performing career spanned over sixty years, during which time he played in a total of 2,368 performance events. The bulk of his performance was naturally given in recitals, both solo and with orchestras. He made 197 recordings and 82 radio broadcasts. 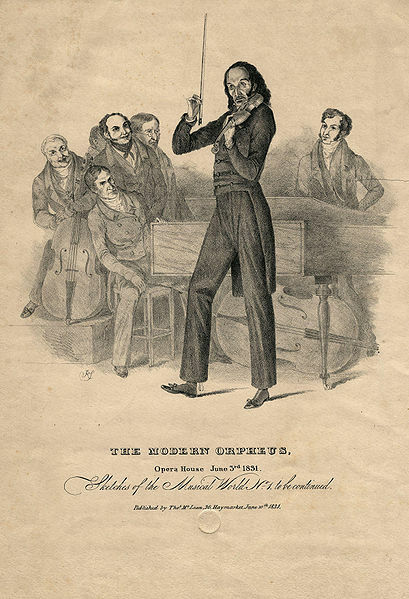 His chamber work was the rarest of his performance appearances, with only 28 concerts under his belt. By the time he gave his London debut in 1920 he had already sold 20,000 copies of his early recordings. Jascha Heifetz was a crowd pleaser, an audience wower, he was born to perform. But all the talent in the world would not have served him without the relentless work ethic and self-discipline that he exhibited throughout his life. The one time he allowed his practice schedule to lapse for a little too long served as a painful, but essential lesson in his blossoming career. Let’s have a break and listen to some early, vintage recordings of the wunderkind! Soon after his debut Heifetz performed a devilishly difficult programme piece by Beethoven, the Chorus of Dervishes from The Ruins of Athens. The Russian Revolution ensured that Heifetz remained in America and he became a citizen of his adopted homeland in 1925, where he lived for the rest of his life. At first he settled in New York and moved to California in the late thirties. During the Second World War he toured camps across Europe with the USO, playing to soldiers to lift morale and give some cultural interlude from the horrors of war. Ayke insists that Heifetz told her he thought it was one of his best ever performances. In his later life as his performance career diminished Heifetz would often reminisce to her about his soloist days. She relays the story of when Heifetz played a private concert for Hellen Keller, who very touchingly could feel the music vibrations through her fingertips as she held on the scroll of his violin. She had impressed Heifetz greatly. Shock, horror, a bad review! For most of his early life Jascha Heiftez had received nothing but praise. And rightly so, he was one of the most outstanding violinists of his time, and indeed of all time. But his popularity in America, which furnished him with success and freedom, enabled him to let his hair down a little and enjoy the good life. In his own words, Heifetz admitted that it was not until he had reach adulthood that he could behave like a child. In his childhood he had endured a strict regime of musical studies. It’s certainly understandable that he would want to relax and enjoy the fruits of his success for a while. But the lack of practise during his first four years in America had begun to show in his performance. Nothing had prepared Heifetz emotionally for a bad review, and when scathing criticism came his way after one fateful New York concert, it wounded him deeply and jolted him out of complacency. Although his pride was hurt, Heifetz actually agreed with the reviewer that he owed it to himself and music never to be content. It seems he became his own biggest critic from that day on. 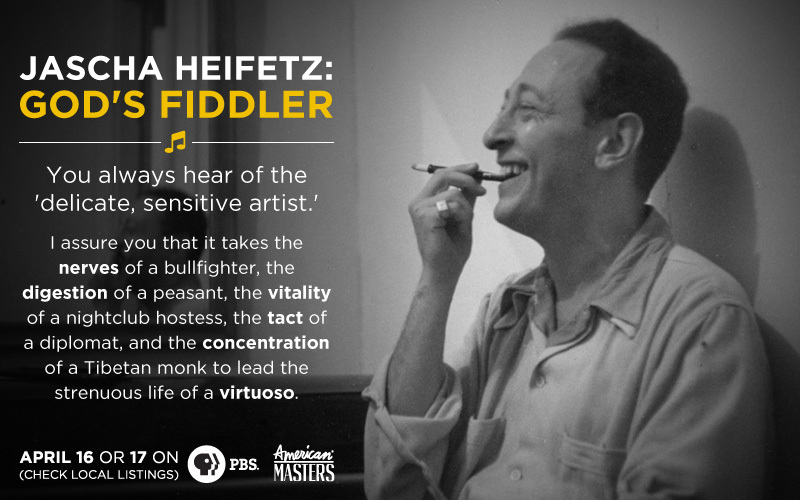 After his ego recovered Heifetz applied himself to rigorous preparation and practice schedules before his concerts. He had set the bar impossibly high, and now the challenge was always to live up to an incredibly high standard. 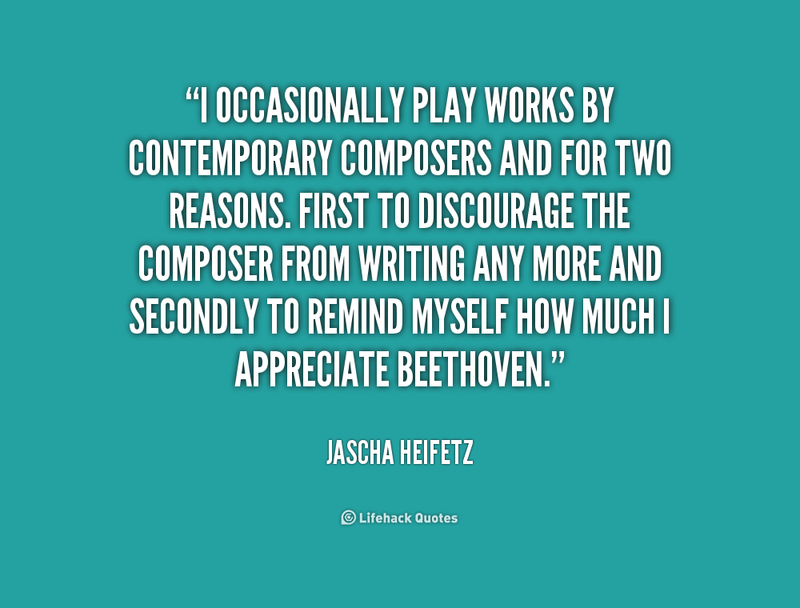 Jascha Heifetz believed that the audience should never feel like the artist is struggling to achieve anything. And in all his clips, no matter how fast and furious the piece, or even slow and legato, he has perfect control and makes it look effortless. He likened performance to making the perfect pitch in baseball. No-one would see, or even understand the effort that had gone into it. His positive mind set comes across brilliantly in a great interview about violin mastery on David Jacobson’s blog. His personal philosophy was drawn from Rudyard Kipling’s poem, If, which he carried a copy of at all times. He said of particular relevance to him was the idea of treating the imposters of triumph and disaster just the same. He understood that an artist’s life meant treading that path between the two. Let’s face it; most of what he achieved was a total triumph, even to the extent that his unrivalled standard of perfection made him a target. At the height of his fame Jascha Heifetz wrote some popular songs under the pseudonym Jim Hoyl, which was easy to use with the same initials. He would also travel under this alias so as not to be easily recognised and identified. It struck me that he was humble and modest despite his international fame. After 1974 Heifetz dedicated himself to continuing the teaching legacy of his beloved tutor in St. Petersburg, Leopold Auer. In his own words Heifetz had said about Auer: “The professor was stern and very exacting, but a sympathetic teacher.” I feel these words describe his own pupils’ experiences. Ayke Agus had expressed what seemed close to terror, “It felt like we were victims.” She related how he would cover the technical aspects, the musical aspects as well as make them play on out of tune violins to prepare them for any eventuality they might face as professional musicians. There is a great clip of Heifetz himself warming up for practice with scales, left handed pizzicatos and he even plays sections of the first movement of Beethoven’s violin concerto, which consists of beautiful melodic scales! Ayke tells of how Heifetz would teach them the importance of bowing technique, and how Heifetz impressed on them that the colour of the tone came from the bow arm. He likened it to a painter with a brush never having the same evenness of colour and shade on the canvas, it wasn’t uniform. He taught them to reach out to people’s hearts. Heifetz himself found staccato bowing the most difficult thing to learn and tried to in-still in his students what Ayke Agus refers to as an ‘honest staccato’, which can only be achieved by having a stiff arm, lifting the bow on and off the string slowly and accurately before attempting a fast tempo. Heifetz did a series of televised Masterclass sessions in the sixties. I have chosen the one dedicated to Bach’s ‘Chaconne’. 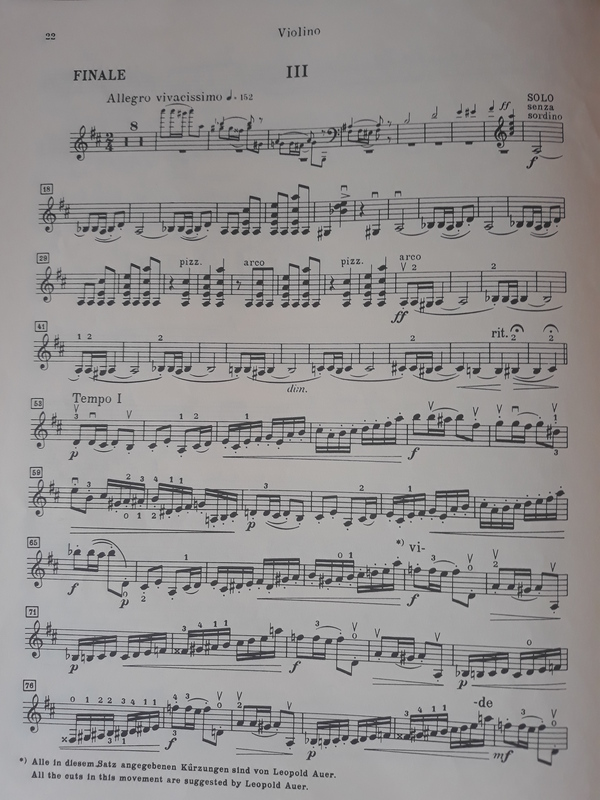 If you have read this earlier post on one of my favourite pieces of solo violin music, then you will know that Heifetz’s interpretation is untouchable. Jascha became known for deliberately playing badly, in order to demonstrate how not to do it. It was something of a party trick. He was also a keen photographer, ping pong player and motorist. Years before Elon Musk was born, Jascha Heifetz spent a significant amount of his money building his own electric car in 1965. He didn’t like the smoke and pollution and decided he would do his bit for the environment. Heifetz also adapted other composer’s works for the violin. He met and admired George Gershwin, arranging his songs from Porgy and Bess for the violin. Jascha Heifetz owned several high value violins, his preferred performance violin being the 1742 ‘ex-David’ Guarneri del Gesù, closely followed by his 1731 Stradivarius. There are no words to describe the pure magic of these vintage recordings! Heifetz’s sound was, and still is distinctive, original and silky, his tonal quality unsurpassed. His sublime phrasing, his unique musical language just send me to another realm and inspire me to practice. I love that you never get sentimentality from Heifetz, but you always get his enthralling blend of power and emotion. If there was any downside to his stellar success I think it showed-up in his private life. He was married and divorced twice, and by some accounts wasn’t particularly close to his three children. He had to balance his career with his family, and I don’t think his relationship with his own father was a warm one. 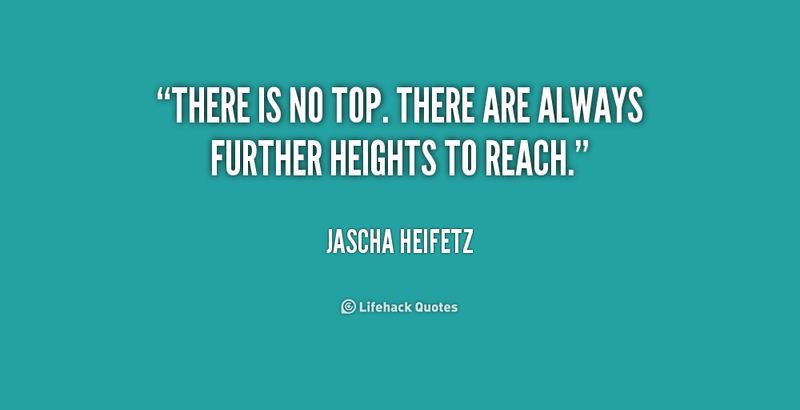 Heifetz was quite introverted and said in interviews that he had felt lonely at the top. His fame had come at a price. I hope you’ve enjoyed his music as much as I have, and please share the post if you think the world needs more Heifetzes! Before reading up a bit for this post I was aware that Louis Spohr (named Ludwig, but he preferred the French equivalent Louis), was a virtuoso violinist and younger contemporary of Beethoven, widely known for inventing the violin chin rest in 1820. I’m very grateful to him for that; I really don’t enjoy playing my violin without one. It’s a fabulous creation. I can’t imagine how violinists managed during the baroque era! He also had the foresight in 1812 to use letters on musical scores as an aid to rehearsal. So he was quite the innovator in many ways. When our conductor at Aylesbury would bark something like: “You made a real hash of the passage between D and E, so let’s go back to D again,” you’d be able to find the place in the music very quickly and easily. I had no idea that this bright idea was down to Louis Spohr. My copy of Mendelssohn’s Violin Concerto complete with rehearsal letters, published on all modern music scores. I was pleasantly surprised and impressed to say the least, when I started to discover his many other accomplishments. His musical compositions were largely unknown to me, despite his immense popularity in classical circles during his lifetime. His fame dwindled after his death and only a small portion of his work remains in modern repertoire. It couldn’t have been easy crafting your notes in the shadow of Mozart and at the same time as the likes of Beethoven, Hummel and Schubert, but to his credit he followed his own path within the parameters of early romanticism. He was widely known and respected in Europe during the early 19th century as a virtuoso violinist, conductor, teacher and composer. He was probably the most famous violinist in Europe until Paganini arrived on the scene with his own fiery brand of pyrotechnics. 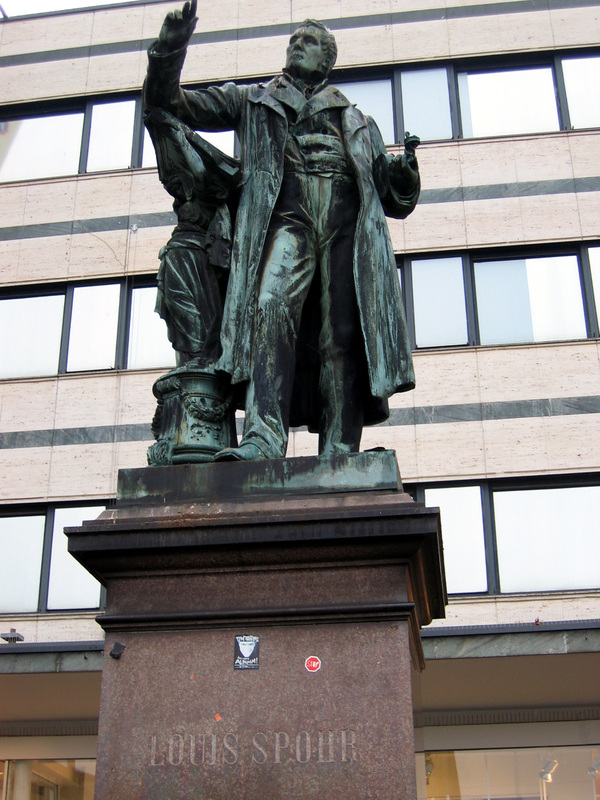 Statue of Louis Spohr in Kassel. Like his friend Beethoven, he also believed in democratic freedoms and was known to possess a noble character. He was unusually tall for the time, being over six-foot. Unlike Beethoven, who was the epitome of the lonely, tortured artist, Spohr was a family man who enjoyed a happy social life and varied pursuits like swimming, ice-skating, hiking, gardening, as well as considerable skill as a painter. Whilst Beethoven was creating music that was innovative, immortal and ‘new’ to the ears of early 19th century concert goers, Spohr appears to blend in with the tastes of the zeitgeist, certainly nothing that would upset the apple cart. But when tastes changes, as they invariably do over time, his more traditional music became eclipsed by Beethoven and Schubert. The so called Biedermeier period (1812 – 1848), saw the rise of the middle class in Europe, paralleling urbanisation and industrialisation, when access to the arts expanded to attract a larger number of people. Biedermeier encompassed literature, music, the visual arts, interior design and architecture. It seems that Louis Spohr was a product of his era, whereas Beethoven was a musician for all-time. Rather sadly he is sometimes referred to as the ‘forgotten master’. As I’ve discovered, his music was mostly written in the romantic genre and I was surprised at the many different instruments he wrote for aside from the violin. I believe his music should be more widely heard and performed than it is. He may not be a Mozart or a Beethoven, but his achievements are worthy of admiration. Louis was born to musical parents; his mother being a talented singer and pianist whilst his father was an amateur flutist. The young Spohr however, despite starting out on the harp, took to the violin. His first tutor was a violinist named Dufour, who saw an opportunity for his pupil to further his musical learning at the Duke of Brunswick’s court. He joined the ducal orchestra aged 15. Three years later he was sent on a year-long study tour of St Petersburg and Moscow with his tutor, violinist Franz Anton Eck. He also wrote his early compositions during this time. After Spohr returned to Brunswick the duke allowed him to make a concert tour of northern Germany. An influential music critic, Friedrich Rochlitz happened to be in the audience during his recital in Leipzig in December 1804, and wrote a glowing review of both his virtuosity and his opus 2 violin concerto in D minor. 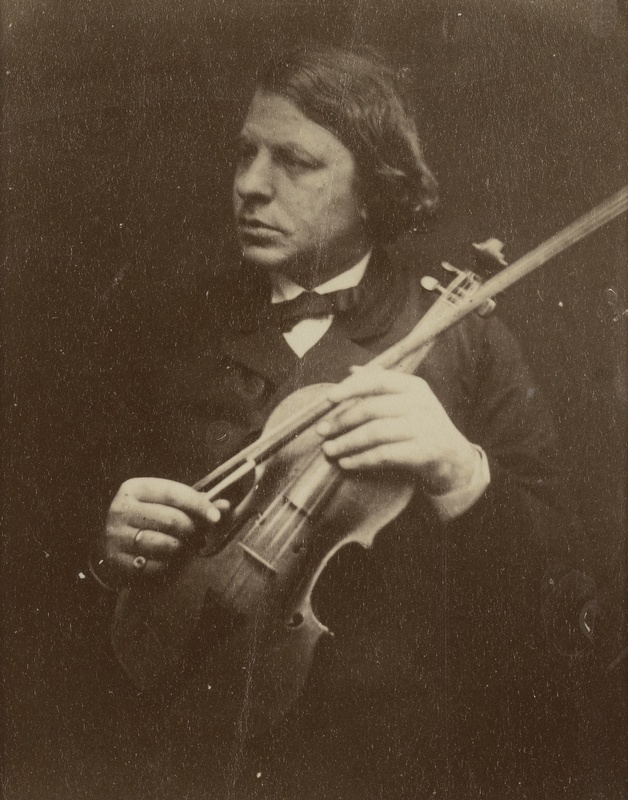 Hence Spohr was promptly catapulted into the pantheon of revered violinists of the early 19th century. 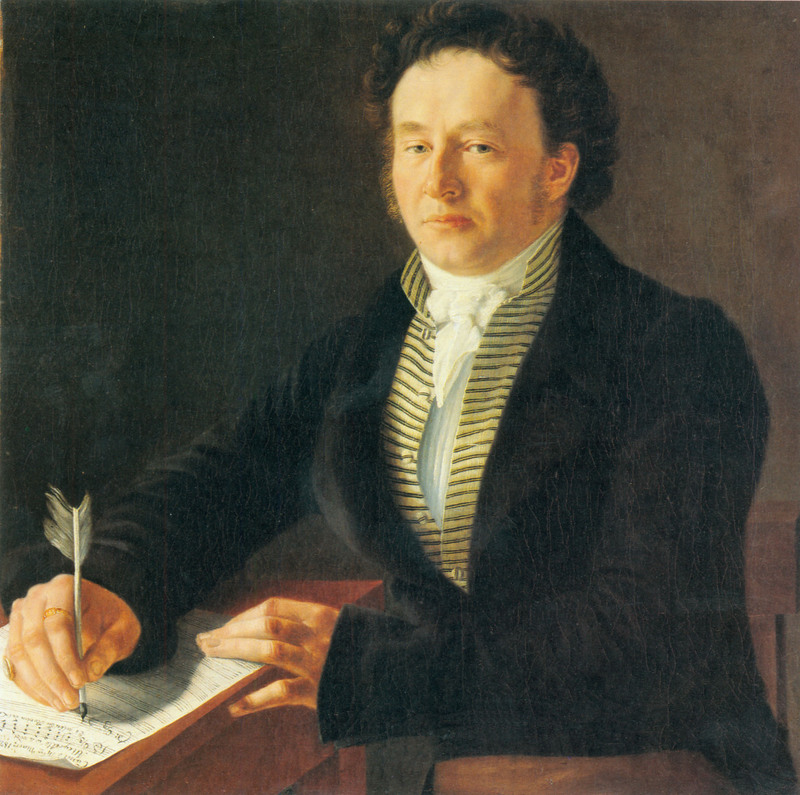 Spohr became orchestral director at the court of Gotha between 1805-1812 until he landed the job of leader of the orchestra at the Theater an der Wien in Vienna from 1813-15, where he met Beethoven. 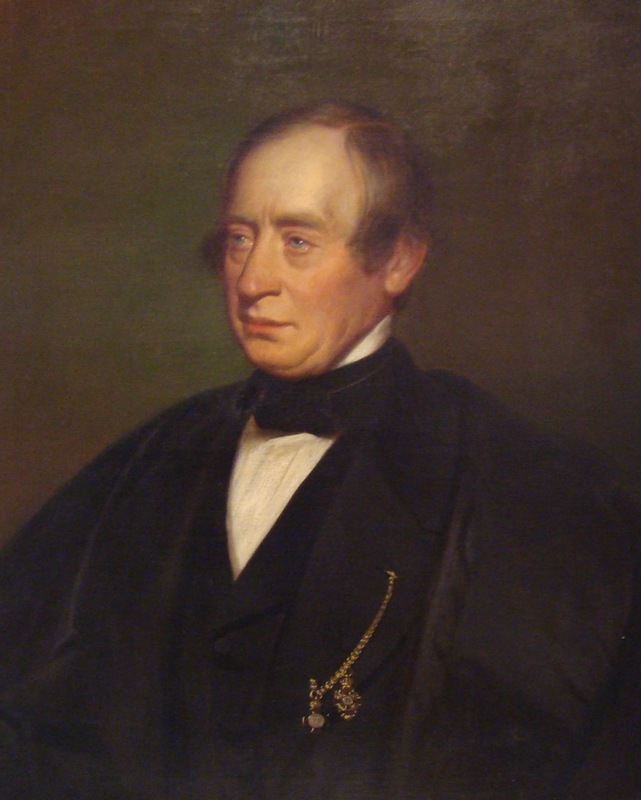 His career progressed as he moved to Frankfurt where he took up the post of Opera Director between 1817-19, and thanks to the recommendation of fellow composer, Carl Maria von Weber, he was appointed Court Kapellmeister at Kassel from 1822 until his death on 22nd October 1859. Incidentally, Kassel was also the place where the Brothers Grimm wrote most of their fairy tales in the early 19th century. During his career and at the height of his popularity Spohr travelled to England on five separate occasions, and was named in an aria from Act 2 of Gilbert and Sullivan’s Opera, The Mikado. Spohr was a prolific composer of many genres: violin concertos, symphonies, clarinet concertos, harp and chamber music, lieder, cantatas, oratorios and operas. I’ve selected a few pieces from each genre to give an overview of his style and talents. He composed a total of 290 works. Although he wrote eighteen violin concertos, six violin sonatas and various duos for violin and harp he did not set out to write purely for the violin in the same way that Viotti, Kreutzer, Vieutemps or Wieniawski did. Like Beethoven, Louis Spohr has nine symphonies to his name, and a tenth unfinished! His Symphony No. 4 in F Major, Op. 86 ‘Die Weihe der Töne’ (The Consecration of Sound), was based on the poems of the same name by Carl Pfeiffer. The first movement opens with a slow introduction, illustrating the profound silence before the creation of sound. The Allegro that follows, in traditional sonata form, includes the gentle sound of the breeze and woodwind bird-song, before the storm that forms the central section of the movement, to die out in the distance in the final bars. The second movement demonstrates the function of music as lullaby, dance and serenade, the last with a solo cello. All three finally combine in a conductor’s nightmare of varying bar-lines and tempi. The third movement shows the role of music as an inspiration to courage, here with a narrative element. Soldiers depart for battle, while in a central trio section those remaining behind express their anxiety, followed by the victorious return of the marching troops and the song of thanksgiving. The final movement buries the dead, to the sound of the chorale ‘Begrabt den Leib’, leading to ultimate consolation in tears. 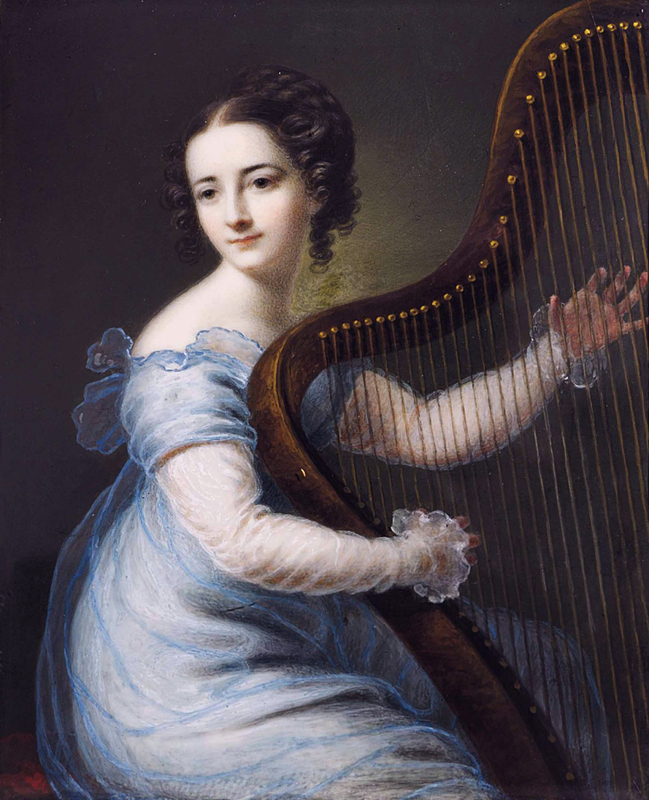 Spohr wrote a significant number of works for, and including the harp, which is entirely understandable as his first wife, Dorette Scheidler, was a renowned harp virtuoso. They were married for 28 years until her death in 1834. Among his output of chamber music are 36 string quartets, 7 string quintets, a string sextet and 5 piano trios. Probably the most performed in modern repertoire are the Nonet and the Octet, for your listening pleasure below. Of the ten operas Sphor composed the two most popular are Jessonda and Faust. Jessonda was written in 1822 to the libretto by Eduard Gehe, based on Lemiere’s novel, La veuve de Malabar. Under Spohr’s baton it was first performed on 28th July 1823 in Kassel, and tells the story of an Indian princess (Jessonda), who is condemned to burn on her husband’s funeral pyre; as was the custom for a widow of a recently departed Rajah. She is ultimately spared by a young Brahmin (Nadori) and eventually rescued by the Portuguese General she was in love with (Tristan d’Acunha). It was popular in 19th and 20th century repertoire until it was banned by the Nazis. So, the big question is, did Wagner take inspiration from Spohr to create his famous chord? I might ignite some controversy here! The Tristan Chord in Tristan und Isolde by Richard Wagner from Wikipedia. Now, what I found in the vocal score of Spohr’s Jessonda – opening the main character’s entrance aria – was an almost identical passage: the same key, the same 6/8 meter and (as I recall) the same rhythms but, more importantly, virtually all the same pitches but one – the next-to-last note in Spohr is a C-natural, an “upper-neighbor” embellishment, where Wagner’s A-sharp is a chromatic passing tone. Spohr composed his opera in 1823. Yet no one calls it “The Jessonda Chord.” Nor does anyone accuse Wagner of plagiarism, either. 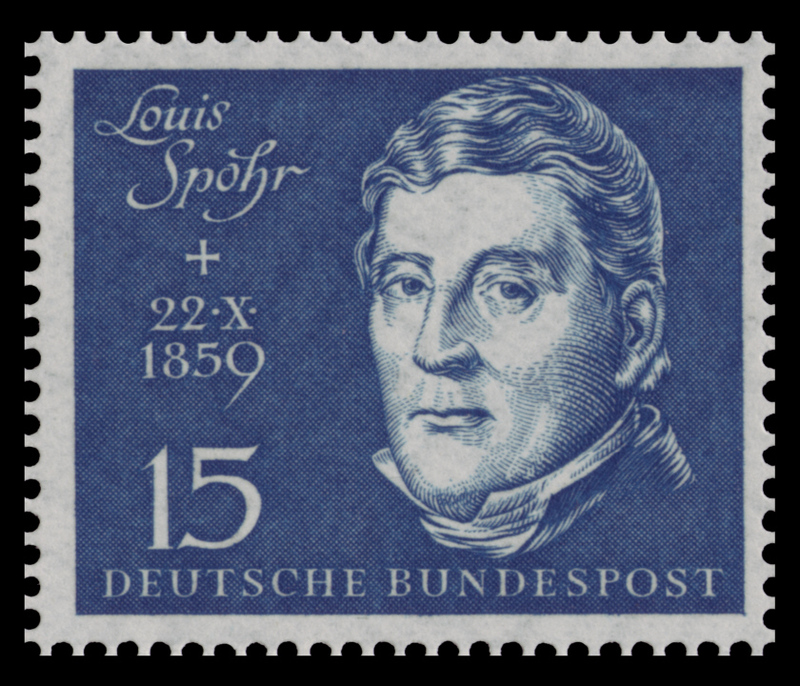 Louis Spohr was one of the first musicians to use a baton when conducting. Imagine the orchestra’s surprise when their leader, instead of using his bow, put his violin down, took a wooden stick out of his pocket, got up and turned the music stand to face the orchestra where he proceeded to wave it about in time with the music. Later in his musical career after he had scaled back his violin performance schedule, his reputation as an eminent conductor meant that he continued to receive many invitations to music festivals and various events, including the unveiling of Beethoven’s statue in Bonn in 1845. He championed Wagner’s music and also played Beethoven’s late quartets, even though it seems he was as baffled by them as audiences were at the time. He also played with Beethoven during rehearsals of the Piano Trio No. 1 in D Major, Op. 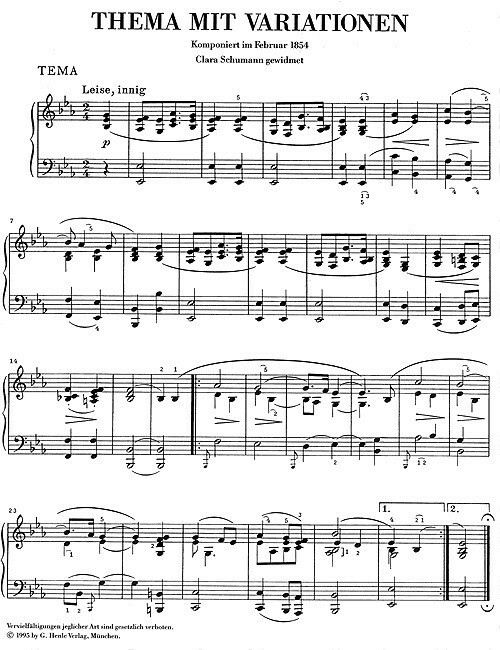 70 ‘The Ghost’ in 1808, commenting on how Beethoven, almost devoid of his earlier technical abilities, hammered away on the ivories and that his piano was out of tune, but he must have made allowances for Ludwig’s hearing loss. Spohr made many valuable contributions to violin technique in the early 19th century and was a proponent of the Mannheim School. He taught around 200 pupils during his career. If I ever find myself in Kassel I’ll be sure to visit his museum there!